While the rest of the world moves to embrace renewable energy why is Australia drawing back? Four Corners documents the revolution in power generation taking place across the globe. The lead journalist, Stephen Long, also published a detailed opinion piece on it the next day, which you can read here. Going by the reaction on Twitter (search for the #4corners tag), the reception from most of the environmental community was rapturous. Who noticed the internal contradictions? Claims of massively falling costs that was already making Australian coal uneconomic — whilst at the same time lamenting the upcoming disaster to investment if the mandatory renewable energy target and other subsides were withdrawn or cut back. Eh? How would you feel about an advertisement for a cold remedy with a tag line: “Our remarkable new treatment will see your cold gone in just 4 weeks!”? That’s about the size of a recent article by Giles Parkinson for The Guardian called … “Solar has won …”. It could also be a suitable paraphrase for an also recent ABC 4-Corners documentary on renewable energy: Power to the People by Stephen Long and Karen Michelmore. The defining claim in the Parkinson piece is a CSIRO report claiming that by 2040 more than half of electricty may be generated and stored by “prosumers”. I’d suggest that same claim, if realised, is good evidence of the ineffectiveness of distributed renewable energy as a climate change response. By comparison, France built an essentially carbon free nuclear electricity system in under 20 years. So while Australian electricity generates 850 grams of CO2 per kilowatt hour, France is down around 70 grams per kilowatt hour and she’s been there since 1990. Germany’s renewable revolution has them planning on hitting the same target by about 2050. As I said in the beginning, renewable energy is the cold remedy for people who want to feel better in a month … or two … while contributing a bucket load of money to their local chemist’s retirement fund. On the other hand, Long and the 4-Corners crew seemed totally messmerised by fields of mirrors; or panels. They filmed them here, they filmed them there, it seems they’re springing up everwhere. I half expected an army of Kevin Costner clones to emerge from behind a heliostat holding a banner saying “Build it and they will come”. Well they’ve arrived and they’re travelling in a van with an ABC logo. Four Corners has done some great investigations over the years, and it’s sad to see them functioning as mere propagandists for an environmentally destructive industry that is too little and too late to stop the destabilisation of the climate. Normally you could expect 4-Corners to care about people paving paradise with parking lots … or mirrors. But nobody even asked the question. What exactly had Apple flattened to build their particular field of mirror dreams? Hopefully, being in North Carolina, the land might just have been corn, as in Costner’s film. And in North Carolina, corn is synonomous with factory farmed pig meat. So it might have been no big loss. But it might have been a forest with squirrels, ponds and beavers, racoons, wild orchids and wood peckers. Perhaps it was an orchard or a field of vegetables. Now, however, whatever was there has been replaced with concrete foundations supporting steel and panels and wires. Is it just me? Doesn’t anybody else want energy that is green as well as clean? Green energy production is all about minimising impact because in the real world, problems rarely admit of perfect solutions; at best we maximise the good stuff and minimise the bad. In this case, we want to minimise our environmental impact while keeping our carbon dioxide emissions below a certain threshold. It’s all about the numbers. But 4Corners didn’t bother with analysis or numbers of any kind. They reduced a complex optimisation problem to a succession of images and slogans. There was no attempt at quantifying anything in any meaningful way. Meaningful in this context implies quantification and the comparison of alternatives. Consider the much featured Crescent Dunes project at Tonepah in Nevada. We got art-house cinematic images of the dilapidated Tonepah township followed by the glittering mirrors and the unquantified claims about the plant “providing power to Las Vegas” … hell, I could supply “power to Las Vegas” with a bicycle driven generator; without numbers to quantify how much energy, then such drivel is simply sloppy journalism. 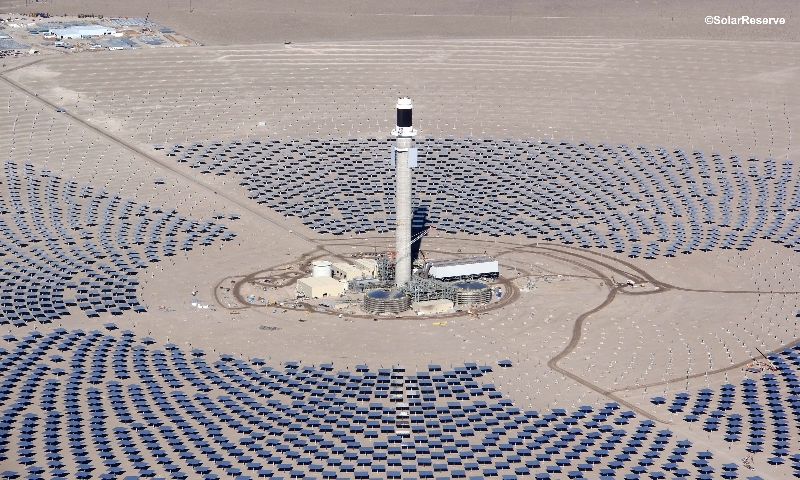 Just as sloppy was the false claim about it being the first solar thermal plant with salt storage in the world and the poor description of how the plant actually operates. But that sloppiness paled beside the omission of any kind of numbers to characterise the plant output in any meaningful way. Talking about “providing power to Las Vegas” may be true but was quite misleading; the plant’s output is tiny and it certainly doesn’t appear to have enough molten salt storage to provide the kind of 24×7 operation which Las Vegas if famous for. Andasol 1 in Spain is a solar thermal power station with salt storage that’s been running since late 2008. It has a nameplace capacity of 50 MW, about half of the 110 MW of Crescent Dunes. Andasol 1 uses 28,000 tonnes of salt to provide 7.5 hours of power. This means that when its salt batteries are fully charged, they can provide 50 MW for 7.5 hours. Crescent Dunes has 31,000 tonnes so can presumably provide 110 MW for about 4 hours. If this was all the power to Las Vegas, then the tables would be in darkness by about 9pm in winter. As an aside, the salt mentioned in this story isn’t just normal salt, it’s a mix of sodium and potassium nitrate that is made in a chemical factory and trucked to the site. Potassium nitrate is common stuff, but sodium nitrate isn’t. The global production of sodium nitrate in 2004 was 63,000 tonnes, so Crescent Dunes will use a rather large chunk of that. It can be produced by leaching nitrate containing ores with ordinary salt (NaCl) or by more complex chemical methods. Any scaling up of this kind of salt storage would require a massive investment in chemical factories and associated infrastructure. A minor detail. Let’s consider the contribution of Crescent Dunes to Nevada’s power supply. The per person annual energy use in the US is 81 megawatt hours (7 tonnes oil equivalent). I’m using an electrical energy unit here but only about 1/6th of this energy is actually used as electricity; 13 megawatt hours. Let’s assume people in Nevada are representative of the rest of the US. They are. Note, this 13 megawatt hours isn’t what people see on their electricity bill, but includes the energy used to make goods and provide services. It doesn’t include the energy used in China and elsewhere to make goods imported into the US. No matter. But, even together with the other 68 megawatt hours, this isn’t the complete greenhouse emissions problem; it’s just the energy component. Crescent Dunes should produce about half a million megawatt hours of electricity per year, so, to clean up all energy production in Nevada, you’d first have to build about 70 Crescent Dunes to clean up the electricity and then another 350 to deal with the rest of the problem. Currently Nevada has two utility scale solar thermal plants. The other has been running since 2008 and is somewhat smaller than Crescent Dunes. You can find the Environmental Impact Statement for Crescent Dunes on the Bureau of Land Management website dated November 2010. The approval took two years from the November 2008 application date. Therein lies the achilles heel of utility scale solar electricity. The environmental impact per unit of energy is large, and the output of each operating unit is small. It might be clean but it’s very slow and it certainly isn’t green. And the number and size of sites that need to be located, considered, chosen, planned and approved makes the process glacially slow per unit of energy delivered. Each EIS typically involves a team of scientists and engineers evaluating a host of parameters from wildlife through to soil types and road traffic freight capacity. Utility scale solar doesn’t just alienate vast tracts of land, it used huge volumes of steel, concrete and the rest. Between 10 and 100 times more stuff than a nuclear plant, depending on which stuff you are interested in. The sad part about the 4-Corners piece is that people may not realise that technical and political issues are very different and that what constitutes investigative journalism in the latter … namely lots of interviews where people spill the beans, doesn’t cut it in the former. Investigative journalism in the former requires a little numeracy and a willingness to read more than just the glossy brochures of people trying to sell their solar toys to gullible but well meaning consumers. That paragraph full of kWh is a typo I assume? Is not going to achieve anything, it will turn people away from the article, and ensures the meme that BNC is a pure pro-nuclear blog will be sustained. Honestly I couldn’t care what the rest of the article said after reading that. Claims like this lie in the realm of those who can’t form a proper argument. We need all low carbon generation. Criticise where applicable but make it constructive with some solutions. This is just another cynical post that does nothing to inform the undecided. The article needs a serious cynicism cleanse. Good pickup evcricket – thanks! I.C., the greenhouse is being damaged by the “low carbon” power touted by the program and your comment. Anyone who believes that wind-and-gas or solar-and-gas is an adequate replacement for coal-and-gas, is failing to say out loud those two deceitfully-hiding words, “and gas”. What the greenhouse needs is “zero carbon” power. There are various ways of achieving it, and nuclear is significant among the options. Zero carbon power cannot be achieved with anything that includes those two words, “and gas”, no matter how softly spoken. I’m not sure about this IC. There’s no shortage of well mannered, polite and uncynical pro-nuclear evidence on the net, but has it cut through? There’s a place for laughing at idiots. My favourite example comes from Steven Pinker’s “The Better Angels of our Nature”, where he credits satirist ridicule with wiping out the brain dead tradition of settling disputes of honour with duelling. @Rodger: I have no issue with the criticism of the program or discussing why a Coal -> Gas + Renewables w/o Nuclear policy is flawed. My main concern is that articles like this with cynical and disrespectful slurs turn people off. While it may resonate with some pro-nukers it will do nothing in the general populace. It will in fact exacerbate the gulf between Renewable and Nuclear advocates. @Geoff: Pandora’s Promise cut through, and Robert Stone is a very polite and tactful speaker. Watch him more often and learn how to put down an opponent without coming off being rude. Most info on the net is quite dry, sure, but that’s because it’s technical in nature. That’s where skilled PR people come in to be able to construct a message that gets across, criticises, but leaves people feeling like they haven been personally assaulted. “Laughing at idiots”, that right there is a perfect example of what I am talking about. It’s rude and disrespectful and harms the relationship that will be needed between Nuclear and Renewable advocates. Attacking renewable advocates and supporters with crass statements will only play into the hands of fossil fuel players by being able to leverage off that negative PR. Sure there are those out there that are misguided, but tactful language needs to be used. Otherwise they come off as the victim of verbal abuse, and it’s very easy to spin that for them. @IC … Pandora’s Promise is brilliant and extremely well paced to take people on a journey from opposition to support. And what happened? The big cinema distributors here didn’t touch it and it was pilloried (disrespectfully) by those who hadn’t even seen it … especially by those who hadn’t seen it. I think it’s time that the anti-nuclear movement got a little of what they’ve been very successfully dispensing for decades … ridicule. They deserve it. They are operating as unwitting allies for climate change deniers. @Geoff The people I took to a screening haven’t thought about Nuclear a second time since. It’s because not everyone like us is interested in energy all the time, they have other things they focus on in their lives. BUT, and this is the key, when they see a story about Fukushima or another Nuclear accident they keep an eyebrow raised and are empowered to question, because they have seen another side of the narrative on Nuclear Power. At least it’s out there. Who cares if it wasn’t screened at one of the megaplexes. They’d rather screen movies that are entertainment and return a profit, not a documentary that normally reside in smaller cinemas. Keep on going, you’ll only offend the people we need on our sides. Nowhere in the article does it provide a solution to the criticism. You’ve attacked solar thermal, a renewable energy we need in the tool box, and given renewable advocates an excuse to attack Nuclear. From first principles, why do we NEED it in the toolbox? (ref: http://www.zerocarbonoptions.com/media/zero-carbon-options-media-release/). Do you mean from a functional perspective, or as a token of appeasement? @IC: Some people try to be nice about renewables saying we need them (e.g. Lynas … and me in the past). As a political strategy, that’s defensible, but I’ve come to the conclusion that renewables are a serious impediment to real action. While people think renewables can do it all, they will never countenance any nuclear action and, as in Germany, continue to work to close nuclear plants. So I’m very much against wind/solar. Not because a system with 20% or so from these sources would be a problem but because they mislead people into thinking there is a renewable-only solution. @Barry: Solar Thermal in SA is expensive, we’ve all see the report from PB commissioned by Alinta. It needs to come down in price, sure, but it will be needed as a part of a mix with wind etc. to manage the grid. The grid needs baseload, intermediate load, and peakers to ensure that a constant feed at the right frequency is supplied. If Renewables and Nuclear aren’t in the mix it is going to be one of them and Gas. I’ve seen the Zero Carbon report, I know it well. It showed some serious issues beyond just economics that need to be overcome for solar, wind, and nuclear in South Australia. It’s interesting that Germany is brought up by Geoff. Because when you look at the data from the Frauenhofer institute with an open mind Renewables are working but are being hamstrung by the Nuclear phase out. The graphs from the Frauenhofer institute illustrate perfectly what I mean by having a mix of Renewables and Nuclear as it can be seen graphically i.e. shift Nuclear into the Brown from below and the Renewables from above into the Brown below. If those Nuclear plants didn’t close there would be more zero carbon electricity. I support both Renewables and Nuclear. Attacking one for the sake of the other isn’t going to work. Accept the weaknesses, develop solutions, and produce a policy that has a chance of working. The reason why the Renewable people get traction is that they celebrate every success no matter the size, and make people feel good about supporting them. Cynics don’t get anywhere. I’m with Irregular Commentator. When I first came across bravenewclimate.com, I wanted to find out as much as I could about its pro-nuclear stance, so I engaged with it, asking on one of its forums about the problem of nuclear waste. I received such ridicule from some of its regular correspondents that I pulled my head in. What’s more, I concluded that their refusal to engage with me meant that they must’ve had something to hide. No wonder the pro-nuclear lobby is losing the battle. @IC: again, the same data can be viewed in two ways. I’d be saying your Frauenhofer charts show that even with the best will in the world and bucket loads of money, renewables are incredibly slow to roll out. And unlike nuclear, they get slower to roll out as you get more of them. First, good sites get harder to find, second, you have management issues due to various peaking and congestion problems with the grid and thirdly, even the richest country in Europe is running out of money. Snark-Hunter, could you provide a link to the thread that you are concerned about? The battle that is being lost is the one against fossil fuels and carbon emissions. It’s still not clear to me why it will be needed. If one is sure molten salt storage is a practical idea to provide heat for dispatchable backup (I remain unconvinced), then why is it a better idea to hook this up to a solar thermal plant rather than a nuclear plant? With a nuclear plant that runs 24×7, pumped hydro is also viable. It is not with an intermittent source. No Geoff. Its not just you. I have always argued that the use of Solar and Wind has to be "appropriate". And by that, I mean it be effective and not destroy the landscape, ecosystems and biodiversity. The size of the footprint for these, compared with Nuclear, cannot be justified. Using Nuclear should mean that the extra infrastructure – the grid – should be much less, and impacting on less new country especially if it can replace coal power stations in situ. I can see the use of Wind and Solar justified in small remote communities unlikely ever to be connected to gridpower. While there is a lot of material on the footprint and impact on the natural environment, the emphasis that comes through is on that persuadingNuclear is emission-free, safe and reliable. My experience is that there are a lot of people out there who have worked hard to preserve the natural environment in forest and national parks campaigns who don't see that so much of what they fought for is at risk from their rejection of Nuclear energy and support for renewables. If those people can be convinced that Nuclear energy is a good option, and they also see the impact of the Solar and wind on the natural environment, then we will take a giant step forward. Also, from my discussions, many of those same people see only the domestic supply as apart from what I call the society need for electricity. So the rooftop solar with batteries works for them, and so it should be sufficient – just upscale. removing that disconnect would also help. These are two things that I try to work on in my small way. Barry Brook asked: “Snark-Hunter, could you provide a link to the thread that you are concerned about?” Sorry, Baz, it was a long time ago. I’ve looked, but I don’t still have that information. Regarding the complaint by Irregular Commentator & Snark Hunter about getting what they perceived as a rude reply to comment or question. Nuclear power is one of many areas of contention that need the equivalent of the ‘Index of Creationist Claims’ Which lists the lies or half-truths of the creationists & giving refutations. It is tiresome to hear some probably honest inquirer asking about some lie or half truth, & have to explain for the nth time why it is wrong. Having a convenient list to link to would save a lot of time & make one less likely to be rude. Re: the claim that nuclear power is dangerous. Re: the alleged link between nuclear power & nuclear weapons. Germany installed renewables faster than was planned and that’s why they are slamming the brakes. Don’t compare that to France. France didn’t set their goals “in 50 years” but “in 20 years”. If Germany chose to build in 20 years then it would do so. But it didn’t. It chose to make a gradual transition by 2050. So did Denmark and Britain for that matter. In principle, renewables can be scaled much faster than nuclear because it’s low tech (compared to nuclear) and there are no constraints in expertise and resources. There are serious constraints in scaling nuclear. Also, this blog seems to be massively underestimating storage advances. Storage is coming and it’s gonna allow renewables to go beyond 20-30%, up to 60-70% penetration and more. To name just a few companies: Isentropic, Ambri, Eos, Lightsail, Aquion,.. They have already demonstrated feasibility of their ideas with small scale demonstrations, and they’re working on full scale pilot projects. Actually Aquion has already started to offer their batteries commercially. Nuclear advocates will of course downplay and ignore this, but like it or not, storage is coming. Snark/Marty/IC: Engaging with an individual genuinely wanting to know something is rather different from critiquing a program researched and prepared by paid professionals who could have read Gwyneth Cravens or Michael Fox’s newish book (http://ukcatalogue.oup.com/product/9780199344574.do) multiple time just while sitting on planes flying to the places they filmed the story. I’d suggest if they had spent more time reading and less time flying, the program could have been much much better. It damn well should have been better. Commenters on BNC can certainly be blunt, but they tend not to be rude and the moderators have a good record of dealing quickly with such behaviour. But some people are incredibly easy to offend and that makes life complicated for those of us more used to robust disagreements :). @Geoff: Put it in the forum then. As I see it this BNC web address was pushed as the “go to source” on level headed information on all low carbon energy sources (I refer to LCA here) and the IFR. There are critiques and then there are the constructive ones. Yours falls into the former. Being snarky and saying “it’s you that has the problem” will fail 100% in every effort to discuss clean energy. It will back Solar Thermal people into a defensive posture and be unwilling to have that discussion. Barry has said that everyone is losing to the Fossil Fuel industries, it’s because people are too busy sniping at each other to gain supremacy. If Germany have indeed rolled out renewables faster than planned and now have to back off, then where does Vallenfall’s recently granted licence to mine an additional 200+ million tonnes of brown coal fit into the narrative? 2000 hectares of new mine, 800 displaced persons and business-as-usual for Germany’s largest coal miner don’t appear to me to be part of a plan to rely on renewables. German companies are in the process of constructing more than 20 new brown coal generating plants, yet somehow these are described as being a “bridge” to a renewables-based future. How can this possibly be true? When even the Germans are dressing ramping up of reliance on world’s dirtiest energy source this side of camel dung in this way, even the most ardent fan of a renewables-only electrical future must wonder whether the German dream has failed to meet is promises. Solar thermal is not winning in Germany – brown coal is. Wind appears to be holding its own, although somewhat constrained at times due to lack of high voltage transmission capacity. At the very least, if you want your excuse of “Germany installed renewables faster than was planned and that’s why they are slamming the brakes.” to be taken seriously, please provide us with some data to support that hypothesis. Frankly, I don’t believe that there is a grain of truth in it. Not only is this comment unsupported factually, it is off topic. This site, BNC, has long discussed storage options, in the form of molten salt, pumped hydro, hydrogen, batteries, other organic gases, ammonia, compressed air… there is a real willingness to consider and to welcome developments in energy storage options. Unfortunately, to date nothing of industrial scale approaches cost effectiveness. We are all aware of extreme locations where energy storage is viable, examples including small islands, yachts, extremely remote locations and even Hawaii. Many who are attracted to nuclear power as a component of a balanced low-carbon option would also be attracted to energy storage options, if they existed, but they simply do not. Nuclear options do exist. Yet nuclear power is being phased out by the largest country in Europe while it is increasing the size of its brown coal industry. How does this compute? Since posting m last comment regarding Germany’s energy trends, I have come across a chart which indicates that I was not entirely correct. It is well worth following this link, if only for the chart, which shows Germany’s electrical energy generation for the first half of 2014 Vs 2013. Brown coal, black coal and gas: Down 14.8 TWh. So, German brown coal production year-on-year may be trending down, but that trend will not last as newly approved German power stations and coal mines come on line. Besides which, Germany’s production is only part of the picture when it comes to consumption, which is the far more significant measure. Germany imports and exports electrical power to various neighbours. Any trends in production may be deceptive due to the magnitude and carbon intensity of their imported electricity. IC, thank you for your persistence and persuasion. I have checked my own style, and find only that, like Jim Baerg, I get cranky after preparing tactful explanations for apparently innocent questioners with loaded questions, only to find that they “had softly and suddenly vanished away”. These coal plants in Germany are not being constructed because of renewables, but because 5-6 years ago big energy companies didn’t think renewables will get so big. Many have now been cancelled and coal use is not increasing but it is remaining steady. Nuclear is decreasing and it is being displaced with renewables. If Germany chose to phase out baseload coal first, then obviously coal would be decreasing and nuclear remain steady. Evidence that renewable uptake was faster than anticipated? Energiewende targeted 2.5-3.5 GW annual solar PV installations. What happened was about 7GW, several years in a row. That’s more than 2x faster. It took everyone by surprise. Then politicians introduced massive subsidy cuts and now things have slowed down a lot. It was not only Germany that was surprised by extremely fast PV uptake. Same happened in Spain and Italy. ” there is a real willingness to consider and to welcome developments in energy storage options. There are several places in the world where storage already makes financial sense. There will be more and more such locations in the future. The trend is pretty clear. Repeating an unsupported assertion does not demonstrate its truth. How about a list of those “places where storage already makes financial sense”? This statement is at odds with the need for Vattenfall’s new approvals for a mine and power station, which I referred to above. If renewables have been too successful, then why are new coal mines and power stations needed, when the logical outcome would be premature closure of mines and power stations? Your statement makes no sense. The article I referenced discussed brown coal’s trends beyond a single year. I don’t have access to trends for Germany’s brown coal industry over a period of one or two decades, but it is plain than something has gone badly astray with the energiewende program. Was it designed to promote renewables because they are pretty, or because they are a low carbon intensity energy source? You seem to think that brown coal power is in more rapid retreat than planned, which assertion I find unbelievable. I’m going to leave this conversation soon, but please understand that most of what you have been saying makes little sense and is unsupported by factual references. I’m not writing this to offend, but to explain my lack of connection with your assertions. Failure even to achieve the planned drastic reductions in nuclear energy output that were envisaged by those who championed the scheme. I wish that I had the time, the knowledge and the space to examine recent German energy history in greater detail, but that is not the case. It seems to me that energiewende has been an ineffective political and emotional response to anti-nuclear activism, dressed up in renewable clothing. If so, it has been a waste of Germany’s treasure (money) and the world’s time. Tokelau is 100% solar powered. They store energy in batteries and it’s cheaper than running diesel generators. One of Canary islands is building wind+pumped hydro. Again, cheaper than running diesel generators. Then you have examples like this: building transmission to a rancher in Texas proved to be much more expensive than using solar+batteries. Oh yes, the Norway’s hydro excuse. What about Spain? Wind had 21% penetration in 2013 in Spain. Have they somehow magically exported power to Norway too? And how did Portugal’s 23% of wind happen in the same year? Or if you’re from Australia, maybe take look at south Australia: at 30% wind and doing just fine (network operator’s words). It’s not that hard to manage 20-30% wind penetrations. Just ramp down flexible hydro or gas plants when wind is blowing, and ramp them up when it doesn’t. It’s been proven in many countries that it works. For higher shares, you need to take a look at what Denmark is doing: they’re combining heat sector together with electricity. When wind is blowing very hard they ramp down thermal generation and turn on heat pumps and store heat (for district heating and hot water). When wind is not blowing they ramp up thermal capacity. This way you can integrate more (up to 50%) electricity from wind. Norway hydro is fine if available, but it won’t get them to 100% renewable electricity. They know that and that’s why they’re working on heat sector (later transportation will also come along). And every one of them is a megawatt (not gigawatt) scale device intended to supply power for a few hours, then be recharged. This is perfect for time-shifting nuclear baseload generation from overnight to the afternoon peak. It is totally inadequate for the multiple days of full load storage needed for all-RE to work. Aquion’s module has roughly the energy capacity of a PbSO4 floor-scrubber battery, but their site doesn’t mention a price. The Index of Anti-Nuclear Claims (needs a catchier acronym) is a brilliant idea. What I’d like to see is also a filter which catches the most common canards and either bans comments including them with a re-direct to the refutation, or hot-links the canard to the refutation and gives the comment a negative recommendation out of the starting gate. The per capita cost of the electricity system on King Island is around seven times higher, and when taxable income is included, the relatively affordability (excluding subsidies) grow to a tenfold difference. Hence, the lessons from the high-penetration renewable system on King Island are mixed. On the one hand, these schemes prove that there is no fundamental technical obstacle to increasing the uptake of wind and solar. But given that the King Island electricity system is highly subsidised both economically and energetically, it is difficult to draw general conclusions as it would apply at a national or global scale. The phrase “not economical” is nonsense and depends on what payback the agents are prepared to accept and what they include in their analysis. Would you get a 4-year payback right now if we replaced Hazelwood with solar and batteries? probably not. Are there lots of batteries in operation worldwide right now that were applied in cost effective situations? Absolutely. There are places in Australia right now where it costs over a $1/kWh to supply electricity. Would solar and batteries provide cheaper power there? Easily, and those opportunities are getting taken up now. I agree with Irregular Commentator. Geoff’s argument is sound, but couched in terms that ensure it won’t reach those who need to hear it; or, if it does, will only hit a brick wall of reaction. Its alienating. An unsympathetic hearing is guaranteed. Its also true that newcomers to this site were treated dreadfully in the past by some regulars. No point dodging it. It happened. It did a lot of damage in my opinion, and turned away a lot of genuine enquiry. We can hope to do better. The Four Corners piece was infuriating, and needs a response, but with care. There’s a lot of crazies out there railing against renewable energy because they’re climate change deniers or for some other non-rational motivation. There are real reasons to be very skeptical of the capability of renewable energy to achieve any significant climate outcomes. But it takes a lot of care when making that case to avoid being mistaken at a thousand paces for the fruit loops. We should avoid that at all costs. Would you get a 4-year payback right now if we replaced Hazelwood with solar and batteries? probably not. Just for fun, I opened the spreadsheet to look at this. To replace Hazelwood (1,600 MW) with a baseload-equivalent PV/battery combination to get 80% capacity factor in the Latrobe Valley would require something like 22GW of PV and 120 GWh of battery (assuming DOD 50%). If we costed PV at $1,500/kW and batteries at $200/kWh comes out at $33B and $25B respectively, with batteries requiring ongoing replacement every few years. I’ll leave it to others to work out the payback! 22 GW PV + 120 GWh batteries to replace 1.6 GW Hazelwood at $58B plus ongoing costs. Yes, solar is winning. For reference, that’s about 2/3rds of Germany’s total solar PV installation (36 GW), and unable to replace a coal plant. Which, oddly enough, is what Germany is finding. @ppp251: During the 70s/80s a bunch of countries rolled out nuclear many times faster than the richest country in Europe is managing to roll out wind+solar (see graph here http://bit.ly/1c1jqaW ). Not 10% faster, or 20% faster, but 2-7 times faster. Why isn’t there even one country who can match these rates with wind+solar? Not one. When you think about it, it’s not difficult to understand intuitively. To get similar annual electricity output to one AP1000 reactor, you need to build at least 8 Ivanpahs and all the associated backup infrastructure and in many parts of the world, this is impossible (try finding the land in Japan and if you do find it). In cold places, like Germany you may need probably 11 or 12 plants because of the reduced sunshine. The big years were 2006-7 (9858) and 2010-11 (18614) and that’s wind+solar+geothermal. Where are the “several years in a row”. By all means download the IEA spreadsheet and double check. I’m happy to be corrected. Compare with UAEs nuclear plans. They are building 4 reactors at 1.4 GW each and once the line cranks up, they will be getting 11 GWh/year … and this is a country with just under 10% of the German population. On a per capita basis it thrashes what the Germans are doing. Different kinds of storage are for different things. Flywheels are good for voltage and frequency regulation, but not for anything else. Batteries are good for time shifting peak for a couple of hours, but not for multiple days of full load. For multiple days of full load you have biogas and biomass. Biogas and biomass can be easily stored and used when needed (which is not that often and can be predicted several days in advance). Biomass can be gasified and put into existing gas grid (same for biogas). Then run a gas turbine when needed. Use power-to-gas as a last resort, if not enough biogas and biomass is available. Of course there are efficiency losses and that’s why other options must be used up first. First combining different renewables, then time shifting with batteries, then using biogas and biomass, and lastly using stored methane from power-to-gas. In that order. But it doesn’t make sense to expect fully developed power-to-gas storage if you haven’t even used up potential of combination of different renewables. One step at a time, most countries (with possible exception of Denmark) are still only at step 1. Even with the best will in the world, this kind of mass forestry is a nightmare for wildlife in addition to being one of the most dangerous industries on the planet (for the people involved). And biogas? Where from? Factory piggeries? I hope not, these are cruel and obnoxious industries and the meat is carcinogenic … so much so that the World Cancer Research Fund recommended it be eliminated from people’s diets. Not just reduced, but totally eliminated. An extraordinary recommendation from a very conservative group of people. For multiple days of full load you have biogas and biomass. <sigh> This (\^\^\^\^) is why I hate trying to discuss energy matters with ideologues and innumerates (most of the former are also the latter). ppp251, in all RE projections I’ve seen, nearly all of the biomass supply that doesn’t involve turning wild forests into the temperate-zone equivalent of palm-oil plantations is already allocated to producing liquid fuels and other materials. A careful reading of The Billion-Ton Vision shows a projection of just 10% biomass-electric for the year 2030—and that is predicated on some highly optimistic production numbers. Ten percent is 36 days per year. No way can you make RE handle the other 329 days a year. @Geoff Russell: Biomass can be used sustainably and if Germany is using biomass sustainably then I don’t see a problem. In the future they will have to stop using it as a baseload power and instead use it as a dispatchable source, but this of course has nothing to do with sustainability. That’s a misleading comparison. Nuclear even at that time had decades of subsidies behind it (first reactors were built already in the 50ies), while wind+solar have just really got started in last 10 years. Now that wind and solar have made substantial progress, any country can decide to achieve the same or even faster uptake rate as nuclear did in the past. It’s a question of willingness to do so, not a question of technology. Take a look at China: they’re now pushing wind+solar at the same time they’re pushing nuclear. And results? Wind+solar are growing much more rapidly than nuclear. China’s wind output has outgrown that of nuclear and difference is getting bigger and bigger. If nuclear really could be scaled so much faster, then the Chinese would have done it. But that obviously isn’t what is happening. @Engineer-Poet: 36 days per year is more than enough to overcome a couple of cloudy windless days. German Fraunhofer institute made a study and found out that Germany needs at most two weeks of electricity storage to overcome cloudy windless days. Two weeks = 14 days. And last time I checked 14<36. A couple of points; Hazelwood isn’t operating at anywhere near 80% CF. It was 57% last time I checked. it’s a pretty unreliable plant now. I’m glad Geoff raised the “nuclear was the fastest ever build” meme, because it shows how little the world cares for nuclear now. Yep, some countries managed to build a few plants quickly almost 40 years ago, and almost nothing since. Great example. And I bet this only includes the build phase, not planning and critically in Australia, the politics. Nuclear power is not on the political agenda in Australia at the moment, still considered poisonous by most of the electorate. To build any plants at all, and it will probably be one to start with, someone needs to take it to an election. It won’t happen in 2016 because the Libs are going to be scared, so we’re at least 5 years before it goes to an election. Then even if they get their mandate it will begin 5-years of planning, then probably another decade of planning and arguments over locations. There is no way a nuclear power plant will be producing electricity in Australia in the next 15 years. To believe anything else is astonishing self delusion. Alternately, I can install solar panels on my roof today that payback the energy to produce them in two years, Like 1.4 million households already have. @ppp251: There’s plenty of ways of running sustainable forestry if all you want is timber, but the kind of large scale harvesting required for electricity production is very different … if you don’t see the problems, then I suggest that’s because you aren’t a squirrel. I really like squirrels, and all kinds of other animals. If we can produce power without massive wildlife suffering and continuous rolling habitat destruction, then why wouldn’t we? @evcricket: solar has had subsidies for decades but the progress has and is necessarily only about cost. Here’s Prof. Martin Green predicting the replacement of coal in 10-15 years http://www.abc.net.au/catalyst/stories/3228140.htm (and that was 1989). The basic productivity per square meter has nowhere to go. It’s all about percentage gains. If you consider nuclear power output per square meter of plant, then instead of the small percentage increases you see with solar, you see multipliers like 10 and 100. The UAE IS a good example. In my chart (http://thebreakthrough.org/index.php/programs/energy-and-climate/nuclear-has-scaled-far-more-rapidly-than-renewables/) I took their nuclear plans as starting in 2009 (when they got serious and went to the IAEA for advice) and their subsequent per-capita build speed out to 2020 exceeded that of the German wind+solar build by a factor of about 3. You can reconstruct the chart taking Germany and UAE back another 3 years if you like, but it won’t change the outcome. The superior historical build speed of nuclear is just a fact. The speculation about possible better roll out speeds for wind+solar, is just that speculation. If it were easy, it would have been done by someone. It hasn’t. The rapid nuclear build speeds were achieved in multiple countries and they didn’t even have a climate change imperative driving them. The false implication that fixing household electricity use is enough to throttle climate change has plenty to answer for. Household electricity is about 25% of electricity use and electricity is only about 25% of energy use (most of which comes from fossil fuel). A million solar rooftops has done nothing to reduce Australia’s per capita electricity emissions (unless you count stopping them rising even higher than they would otherwise have done). Based on our latest UNFCCC submission (april 2014), per capita fuel combustion emissions in the energy industries (mostly electricity) rose about 25% between 2000 and 2012. As for the politics. Polling (e.g., http://decarbonisesa.com/2014/04/03/polls-and-perceptions/) shows the public isn’t as anti-nuclear as anti-nuclear movement wants people to believe. If we had a consistent view that climate change was a serious problem, then nuclear would be an easy bipartisan sell. In Australia, we’ve had over 3 decades of green/Greens preferring anything at all, including coal and gas to nuclear. Which is why we are in our current spot as a global greenhouse emissions leader. You can install solar panels on your roof, but without storage or DSM to schedule use with availability you are essentially using the grid as a battery—which it is emphatically not. As the grid operators have to chase increasing amounts of variability in the demand curve (including the possibility of going negative), efficiency goes down and cost goes up. That has to be subtracted from your payback in a complete accounting (just because you don’t pay it doesn’t mean it’s not there). If the law demanded we take as long to plan solar as nuclear, we’d never have had a single panel feeding power to the grid. @evcricket, a long way up thread. I followed that link and then another until I figured out what “commercial” means to evcricket. The battery bank has a total capacity of less than half a minute’s output of the conventional power station it is attached to. In my power station experience, this is equivalent to turning off a few minor auxiliaries during a temporary dip in frequency. It is absolutely useless when it comes to supporting a under under overload. The only justification I see for it is as a backup supply to power essential controls and safety plant during rundown after failure of the power supply to a unit or to the whole power station. These events are very rare but also very expensive, with turbine damage running into the tens of millions of dollars a distinct possibility. Conventional power stations use batteries – rooms full of them – for this purpose. They support the batteries with diesel and open cycle GT’s. I have worked on each of these plant items in numerous power stations. It seems that your example merely replaces one of these emergency backup power sources with more lithium batteries. In no way does this demonstrate commercial competitiveness relative to other power technologies. I salute the Chileans for their project’s success. Please do not try to cherry-pick your data by assuming that a successful specialised small scale demonstration demonstrates general applicability technically or commercially. It does not. As stated often above, there is nothing wrong with these types of trials and nobody is arguing against alternative generation technologies… the world needs them and soon. The problem with your own contribution is precisely parallel to that of the 4Corners program which kicked off this column. They both lack appreciation of the technical and commercial impracticality of the technologies that they trumpet. Batteries provide ancillary services such as voltage and frequency regulation. They’re very good at this because of their fast reaction times. Their distributed nature makes them suitable to relieve congestion at some parts of the grid, another competitive advantage. Given the trends it won’t be long until they become cost effective for peak shaving and shifting solar generation into evening hours. Probably in about 5 years. But it makes no sense to wait, because a lot of wind and solar can be installed before that. I am not convinced at all that nuclear can be scaled faster than renewables, let alone scaled to global levels. 70ies and 80ies were a very different time than today. Reactors were much more dangerous (and therefore cheaper), politics was in favor of nuclear (cold war, energy independence,..), and it was a time when it was easier to make centrally-planned projects work. There are limitations on all these issues today. In addition there are serious limitations with scaling nuclear to global levels. Uranium supply is not sufficient (I could end right here), amount of exotic metals is not sufficient (hafnium, beryllium, zirconium, without these nuclear doesn’t work, and even without scaling they all have other competing uses), there is not enough expertise to build and run such a huge number of reactors, and this is even before talking about huge amounts of waste and accidents every couple of years (which would happen from a pure statistical point of view, because of such a large number of reactors). I don’t see it happening, and when you think about the numbers, it’s not even possible for it to happen on global scale. But wind and solar are relatively low-tech, not constrained by materials, land, resource or anything else and have proven to be massively scalable on global levels. It’s pretty clear that this is much better way to go. @ppp251: you remind me of me when I was anti-nuclear, I kept repeating stuff I’d heard without checking. Please read something other than anti-nuclear propaganda … google for book by Gwyneth Cravens or Michael Fox. E.g., will we run out of uranium? No. E.g., There’s enough nuclear waste to power the planet for hundreds of years even without mining uranium … plus there’s thorium plus … the answers are many. There are no commercially viable reactors that burn waste. And there are no commercially viable reactors that burn thorium. It is very common that nuclear advocates start talking about experimental reactors that noone has any experience with (not to mention they are nowhere near economic feasibility whatsoever). Saying that “nuclear is the solution” and thinking about these kinds of reactors is a complete fantasy. The fact of the matter is that today’s nuclear technologies cannot get the job done, and tommorow’s nuclear technologies are decades away. That’s the hard truth that some refuse to understand. There are no commercially viable reactors that burn waste. There are 400 reactor-years operation of fast neutron reactors. The BN-400, has been in operation since 1980, and the BN-800 is currently in the commissioning phase, with the BN1200 to follow. <The fact of the matter is that today’s nuclear technologies cannot get the job done, and tommorow’s nuclear technologies are decades away. In the short run, yes nuclear cannot make much of a difference, but nor can/has anything else. Fossil fuels will dominate for the foreseeable future. @ppp251: It’s not science, technology or money stopping a global rollout of fast reactors, it’s a perception of electoral disadvantage. Good job Geoff, the failings of the Australian nuclear movement in one sentence. “The electorate is wrong and they continue to be wrong until they agree with me”. If that doesn’t change their minds nothing will. There will be many things needed to change minds, but facts are what they are. If the electorate is anti-vaccination, they are wrong, if the electorate believes the world is 7000 years old, they are wrong. If the electorate believes nuclear waste poses an existential risk, they are wrong. There’s plenty of things about which the electorate is factually wrong. Most of the Australian electorate believes you need to eat meat to be healthy. They are wrong. I believe in the existence of facts … so people who don’t believe those facts are wrong. What do you say about people who don’t believe facts? Nuclear scaled far faster in the 70s/80s than German wind+solar over the last 14 years. That’s a fact. Climate change is a fact. You can bet the planet on a speculation that it’s possible to roll out wind+solar 5 times faster than anybody has ever done it or not. It is also a fact that nuclear power will not generate any electricity in Australia before 2030. Given the trends it won’t be long until [batteries] become cost effective for peak shaving and shifting solar generation into evening hours. And when they’re depleted, you have to start burning something and emitting carbon. Those same batteries can store the overnight surpluses from “non-ramping” nuclear plants and use them to feed the next-day demand peaks. Load-levelling with nuclear plus battery takes about 0.3 days of storage. Solar and wind providers recommend 2-5 days of storage. So you ignore multiple existence proofs that nuclear scales as much as 7 times as fast as wind and solar. Hint: the argument from incredulity is a fallacy. let alone scaled to global levels. The oceans hold well over 1 billion tons of recoverable uranium. 70ies and 80ies were a very different time than today. After the OPEC price shocks, the West took oil dependency seriously. Most of the world ceased the use of petroleum for electric generation; the US and France, among others, replaced it largely with nuclear power. There was no organized opposition to this. Today, the fossil fuels industry realizes that nuclear power can eliminate coal for electric generation (as it has done in France, Sweden and Ontario) as well as shrink the market for natural gas. Plug-in vehicles are a threat to petroleum. It fights with a bunch of different threads of propaganda, pushed by different fronts and pressure groups. Reactors were simpler, and less likely to fail; TMI Unit 1 continues to operate to this day. The simple addition of a gravity-feed water tank to old plants would eliminate most of the threat from site blackouts. We see this simplification in Gen III+ designs like the AP1000. it was a time when it was easier to make centrally-planned projects work. There are limitations on all these issues today. Those propaganda and pressure efforts are very effective. The USA has more than 700,000 tons of elemental uranium in storage, mostly as DU tailings from enrichment. Fissioned in fast-spectrum reactors, this is sufficient to run the entire US economy for 400 years. The required amounts of these materials is trifling even in LWRs, and alternative reactor technologies (LMFBR, MSR) replace them with common elements like nickel. There are reactor designs which regulate themselves by thermal effects. They require less expertise to run than the coal furnaces which they would replace. The “huge” amount of waste is dwarfed by the dross from smelting steel and copper for “renewables”, and major accidents even in Gen II plants appear to require major mismanagement or natural disasters as causative factors. Accidents without substantial radioisotope releases are simply non-events so far as public health is concerned, and Gen III+ plants are robust against such events to the point of needing no intervention for days after a total site blackout. The S-PRISM is designed to cool indefinitely by convection. The more your ideology blocks you from understanding, the less you’d be able to see. wind and solar are relatively low-tech, not constrained by materials, land, resource or anything else and have proven to be massively scalable on global levels. Wind and solar are massively constrained by storage and pose huge integration problems in actual power grids (not stand-alone systems for lighting and small electronics). There is a reason that even Denmark has not yet broken the 50% renewable electricity barrier, while France went to 80% nuclear without a hitch. We do not have time for the rest of the world to learn that Denmark is doing about as well as anyone CAN do. The former is because people like you got the Integral Fast Reactor program cancelled in 1994, and licensing something like Transatomic Power’s reactor under NRC rules and procedures would cost at least a billion dollars. The latter is simply false; every commercial PWR could be refitted with a core like the Shippingport reactor, which ran 5 years on thorium and U-233 bred from thorium. Nuclear has nearly or completely displaced coal from several large electric grids (France, Sweden, Ontario). Saying that “renewables are the solution” is utter fantasy; humanity went away from renewables for the same reasons they don’t work today. The fact of the matter is that you’re reading from a list of anti-nuclear talking points, most of which are outright lies. You should not be allowed to post here. It may also be a fact that certain opinions are just that… opinion. Evcricket may well be correct in his assertion that there will be no nuclear power in Australia before 2030. Why pick 2030? Why not 2050? 2100? Because such statements are progressively more unlikely to be true. Essentially, Evcricket and others like him have closed their minds to nuclear options and now seek to justify their opinion on the basis of their own pessimism. I, on the other hand, choose to remain aware of the possibility that their is a better way to power our country and a couple of hundred others which are in greater need of safe and reliable electricity. I won’t rehash the basics of why nuclear power can demonstrate superior safety, reliability or cost than most or all alternatives. To do so would be a waste of my time, because Evcricket will not read what I write, except perhaps to return here with yet another demonstration of a mind that is already made up and which is impervious to new fact or even old facts. So, to satisfy Evcricket, I am close to agreeing that it is unlikely that Australia will have nuclear power before 2030. I have not given up hope that by 2050, nuclear power will be a major Australian energy source, or that by 2100, it will be the dominant source. I say this, because I retain hopes that Australians are not so stupid as to ignore the cost-benefit result achievable with nuclear power. Besides which, by 2020, my grandkids will be asking me why such an obvious path was not taken, in the face of the much larger problem of global warming. They won’t be swayed by the climate doubters of today and they won’t heed the worn-out antinuclear arguments of today’s pessimists. They will recognise that there was a chance to rebuild out energy systems at the turn of the century, and we flubbed it. What will I tell my grandkids, Evcricket? Do I say that I didn’t even try to understand what will work and what won’t? That I and millions of others made their decision on the basis of public opinion, instead of demonstrable facts? I picked 2030 because it is not on the political agenda right now and will take minimum 5-years to go to an election. Add ten years building and you’re at 2030. My point is that you guys are now campaigning AGAINST the only solutions that can actually be applied. People are wrong about nuclear? Boo hoo, yours is the first issue ever to be sideswiped by politics. We can’t even agree that climate change is happening and all you guys can do is whine about how your technically perfect solution isn’t being implemented, while undermining the technology that is actually making a difference. The nuclear lobby is actively damaging our options to implement technology that works because they are butthurt that they lost the politics. You have done two things which damage the argument and muddy the waters; this nonsense about baseload has shifted the debate in favour of the incumbents. And your whining that renewables aren’t perfect has undermined confidence in them. Anyone not engaged with the debate can now be happy about doing nothing. I raise the time to construct because by then there will be so much solar that nuclear can’t compete. Panel prices have reduced something like 30% year on year for the last 5, maybe more. Who would build a big slow nuclear plant in that environment? If industrial companies want a nuclear power plant well they can put up a proposal for one. I’m not seeing many though, yet there is over 3GW of solar on roofs now, and Qld still getting 4000 applications a month, even with no FiT, a ban on exports and the threat of no RET. Solar has already won, we’re just waiting for the others to finish now. Yes, that’s a fact. But if you make a conclusion that ‘therefore solar+wind cannot be scaled as fast’ then that’s a wrong conclusion. Germany has planned a timeline how their energy transition will occur. They are right on track. If they had chosen earlier targets then faster deployment would have occured. But they didn’t. They chose a gradual transition until 2050 (like many other countries in EU). It’s a planned decision, not a necessity. Global PV and wind deployment are following an exponential curve. This trend is a good reason to think that PV and wind can be deployed at least as fast as nuclear. Good, informative discussion, spirited in the way I have come to expect from Down Under. Here in Washington state there are just over a dozen biomass power stations, all in the 50+ MW range. These all burn forestry wastes, being adjacent to the paper and lumber mills. The units only run in the late fall through early spring. I only know the economics of the nearest unit: the generated power is sold for less than the cost of production, despite the unfavorable season for wind (fall) and hydro (winter). Of course, this way the mill does not need to dispose of the waste in some other manner. My point is that you guys are now campaigning AGAINST the only solutions that can actually be applied. For your claim to be true, wind and solar would have to actually be solutions. As the continued high carbon emissions of Germany and Denmark prove beyond doubt, they are not. They had every chance, including massive political support. They blew it. The nuclear lobby is actively damaging our options to implement technology that works because they are butthurt that they lost the politics. Wrong. Nuclear advocates are trying to prevent massive destruction of resources in the pursuit of fraudulent solutions. The politics can block action and waste effort endlessly, but cannot change physics. Nature has the only vote that counts. I raise the time to construct because by then there will be so much solar that nuclear can’t compete. Panel prices have reduced something like 30% year on year for the last 5, maybe more. Who would build a big slow nuclear plant in that environment? Because even if your solar panels were free, you would still get no power at night and very little in the winter. Your cost of dispatchable power (not energy-whenever-fickle-Nature-decides-to-give-it-to-you) would be driven by the cost of storage, of which you would need huge amounts (many days). Nuclear is unaffected by seasons and can follow daily demand curves with about 0.3 days of storage. if you make a conclusion that ‘therefore solar+wind cannot be scaled as fast’ then that’s a wrong conclusion. It’s a conclusion proven by experience. The unreliable, low-capacity-factor sources are very hard to scale up beyond instantaneous demand. This limits their fraction of contribution to roughly their capacity factor, unless there is substantial export/dump capacity available (such as Denmark has with Sweden and Norway). France scaled nuclear power to 80% of consumption in roughly 11 years, because the capacity factor of nuclear can be above 90% (and France engineered their plants to be better at load-following). Germany has planned a timeline how their energy transition will occur. They are right on track. The beginning of a logistic curve looks like an exponential. Wrong. PV and wind have never, anywhere, done what nuclear power has done: decarbonize a large electrical grid in an industrial nation. That is not for lack of trying. Denmark continues to burn coal; Ontario does not. I’m going to need a reference for the claim “you need at least three days of storage for renewables”. When, in Australia has there ever been zero renewable energy for three whole days? We’ve got tonnes of data on the weather now too so your claim should be very easy to support. In the Pacific Northwest it is common to have 6 weeks in the fall with almost no wind generation. Obviously the solar panels are not producing as much then either. Is the Pacific Northwest in Australia? Well, after a whole week of half-perfect weather of course. The Pacific Northwest is in North America. The problem of carbon dioxide is global. @ppp251 and @evcricket: France has been generating electricity for 70g-co2/kwh for over 24 years (IEA). We have been generating electricity for about 850 g-co2/kwh for all that time. So please answer this question … what would have happened to global emissions if the green movement had targetted coal instead of nuclear for the past 3 decades? Those of us old enough to remember (or erudite enough to look up the history) the 1970s/80s remember hearing all today’s claims about renewables before. More than a few large solar and wind farms got built and have been rusting away ever since. I used to believe both all the current renewable claims and all the anti-nuclear rhetoric. I’m now 100% clear on exactly why my prior anti-nuclear stance was wrong … it was based on claims that were either plain wrong or on science about cancer which has long since been abandoned. Scientists used to think that only radiation could cause double strand breaks, and they had no idea about DNA repair. Scientist now understand why people receiving a massive whack of radiation during the WWII bombings had a smaller cancer increase than if they’d migrated to Australia and adopted our lifestyle. Our concerns about radiation aren’t just wrong, Fukushima has shown us how damaging they can be. Inappropriate fear killed people, plain and simple. Inappropriate fear drove the green movement to fear nuclear more than coal and gave us 3 decades of high emissions we really didn’t need to have. I do take your point about the political difficulties of getting nuclear up in the Australian environment, given the anti-science stand of the Greens toward radiation, but I’m encouraged by the successes of the anti-smoking campaigns. It isn’t at all difficult to correct the widespread ignorance given a reasonable budget. If we had built nuclear instead of coal then carbon emissions would have been much lower. But it’s not the greens that have stopped nuclear. It’s the economics. Nuclear has huge upfront capital costs and payback is painfully slow. When you add up costs for decommisioning then it’s more expensive than coal. This is not very attractive for investors and that’s why coal and gas was built. Upfront capital costs are lower, payback time is faster and profit is bigger. Easy choice for an investor. It’s the economics that drives a lot of these things. That’s why renewables are picking up. It doesn’t matter if the system costs are going to be higher in 20 years, it’s the upfront capital cost and payback time that counts. @Engineer-Poet: Denmark had been nearly 100% coal powered in the 80s, now it’s less than 50% and it’s continuing to fall. Wind power is clearly reducing coal use. Germany has decided to phase-out nuclear first, and coal later. Renewables are replacing nuclear at the moment. But this doesn’t mean that renewables cannot replace coal. That’s a wrong conclusion. Obviously many EU countries show that renewables can and do replace coal (Denmark, Spain, Portugal). Who would risk building nuclear after Shoreham? It was devastating and it gave strength to the anti-nuclear movement everywhere. Once the anti-nuclear movement stopped Shoreham, the wheels fell off everywhere except in those places with strong Government backing, like France. Sure, nuclear is more expensive than coal but it doesn’t kill people. The anti-nuclear movement has never shown any concern for the victims of coal power plant pollution or coal mining. If they had, then they could have used the same strategies to make coal really expensive … ie., wheel out an army of lawyers in response to any attempt to build a coal plant. But they didn’t do that. They did nothing … “they” includes me. Mea culpa. Once the anti-nuclear movement had stymied the roll out, then gas took off. Gas production in the US was falling until Shoreham, but with nuclear sidelined gas could and did boom. The Chinese are showing what the intrinsic cost of nuclear is once you take away the lawyers and the politics. It’s actually quite cheap to build safe robust reliable reactors. Extraordinary claims demand extraordinary proof, of which you have offered none. Now, some writers on this thread have accused BNC of being unkind to its visitors, but what do you expect us to do when someone says, completely unjustified, that black is white. Please, take a look around this site and you will find that some folk who are smarter and more knowledgeable than I am have had a very good look at the stream of common statements that at first glance appear to blow nuclear power options out of the water. In every case, the real world is more nuanced than that. Sweeping generalities simply do not stand up most of the time. The often-heard claims of hidden costs for nuclear need to be examined, considered and debated, just as the true costs for all electricity systems should be, and this is not simple. It certainly needs looking into the actual figures and considering their sources and that is why I like this site. Things on BNC might get discussed roughly. Some might say, too vigorously, but at least we do not accept unsupported assertions that some toss around like debating points at an undergraduate debates night. Each of the regular contributors tries, to the best of his abilities, to back up his statements (and they are mostly “his”, more’s the pity… where are the ladies?) with demonstrated, authoritative facts, preferably peer reviewed ones. That said, we really do welcome comments and discussion from those who come here with enquiring minds, regardless of their current stances. But we appreciate most, those who are prepared to read up, to analyse and to increase their knowledge. Those who think that BNC is a site where the loudest voice carries the day are mistaken. BNC, to me, is about accessing those wondrous pools of knowledge that the internet can bring together. In so many ways, its strength is in the quality of the shared journey as we exchange knowledge. It certainly is not about conforming to dogmas. But I suppose you’re just going to blame every one of them on green movement, right? People have died because of uranium mining in the early days, so your claim is not entirely correct. Public concerns over radiation safety didn’t just appear out of thin air. There was harm being done and concerns were result of that. Maybe later it was wrongly overblown, but to blame green movement for nuclear economic failure is just as wrong. That’s a bit far fetched. Sulphur scrubbers and acid rain regulation is a direct result of environmental concerns. It made coal more expensive, but unfortunately it’s still relatively cheap. That’s why I’m optimistic about renewables – they’re starting to beat coal on an economic basis. That’s a game changer (that’s different than in 70s/80s). I don’t have much hope for climate negotiations. But economic driver is a very powerful one. It’s probably the only realistic driver that can phase out fossil fuels. Checking Wikipedia, which uses the EIA figures so only applicable for the USA, new thermal coal and new nuclear have the same LCOE, close enough. The LCOE is much higher than that for the new builds in the UAE. Why? People often say this, but it seems to be that it’s an attempt to please everybody politically, not a technical attempt to actually solve the problem and do the job most efficiently. The fact is, some technologies are faster and better and cheaper than others. If technology A is cheaper and more scalable to do the job compared to technology B, and technology B has higher greenhouse gas emissions, then we do not need technology B. Use whatever technology replaces coal plants most realistically, rapidly and scalably, providing actual high-reliability energy at the same scale as the plants being replaced. “We need all technology” seems to mean that we’ll toss some money to the inefficient “loser” technologies just to make everybody feel happy, even if the money is not needed to actually do the coal-replacement job and doesn’t contribute anything. This sounds firmly like a politician’s problem, not an engineer’s problem – but how many billions of dollars do you allocate in the budget just for this pointless appeasement? Would be interesting to see peer-reviewed source material on this sort of thing, that doesn’t come from an anti-nuclear-power activist organisation. Storage is coming? We’ve had batteries for centuries. Storage, just like PV, solar thermal, or wind energy, is not some revolutionary new technology that was just invented yesterday. We’ve had batteries for ages. We use batteries everywhere, every day. The most strident pro-nuclear-energy proponent uses batteries every day. We don’t use batteries on the scale of power stations – not because we don’t know how, but because it’s far too expensive (as well as being too polluting and too dangerous) to build enormous batteries on that scale and it is superior to use high-reliability generation such as nuclear, hydro or coal. Really? And from what credible peer-reviewed source do you draw that conclusion? Just for a moment, let’s just pretend that 1GW of nameplate capacity PV takes the same time to deploy as 1GW of nameplate capacity nuclear. That’s a fairytale, but we’ll play the hypothetical for a moment. The PV system is far more expensive. The PV system uses far more land. The PV system has noticeably worse LCA greenhouse gas emissions and energy intensity than nuclear power. The PV system is more dangerous to health and to the environment, especially when all the manufacturing is outsourced to poorly-regulated developing world conditions to try and bring the cost down. The PV system generates energy far less reliably, with a <20% capacity factor as opposed to a 95% capacity factor. The PV system is geography-dependent, and needs to go in a sunny region – with transmission access, workforce access, construction, transport and similar logistics issues, as well as consideration on the impacts on a desert ecosystem. On the other hand a nuclear power plant site can be basically anywhere. "Tokelau is 100% solar powered. They store energy in batteries and it’s cheaper than running diesel generators. One of Canary islands is building wind+pumped hydro. Again, cheaper than running diesel generators." Obviously Tokelau and the Canary Islands are not developed, industrial economies with substantial populations. It does make sense for them to use renewables, possibly along with very small "nuclear battery" SMR systems such as the Toshiba 4S in some cases if value could be had from energy access on the megawatt scale. Yes, solar power, renewables, and battery storage do make good sense, in some contexts, on some scales. We effectively use battery-stored solar PV power to supply very small amounts of power to telemetry, communications or wireless sensor network systems in remote areas, for example. Or PVs to power satellites and near-Sun spacecraft, for example. We already use solar PV and battery storage in remote areas where grid connectivity is not already in place. These systems cost a fortune, especially if you want to support the same lifestyle as everybody else using the grid, but it is viable in cases where establishing grid connectivity would cost just as much. These are not new technologies invented yesterday, they have been around for ages and they have been used for ages – but used where it makes sense and where the energy needs are on a practically small scale, not used where it doesn't make sense. "In addition there are serious limitations with scaling nuclear to global levels. Uranium supply is not sufficient"
Really, this is the anti-nuclear equivalent of the creationist "evolution is fake because thermodynamics", and does not deserve a response. "Reactors were much more dangerous (and therefore cheaper)"
Yes, regulation has increased costs, and this has happily been driven by the anti-nuclearist ideologues. But 1970s nuclear power plants have never hurt anyone. How many extra billions of dollars need to be added to costs to reduce the number of injuries from zero to zero? "Nuclear is decreasing and it is being displaced with renewables." "If Germany chose to phase out baseload coal first, then obviously coal would be decreasing and nuclear remain steady." Even if we don't agree on anything else, could we at least agree that Germany's decision to prioritize replacing nuclear ahead of replacing coal is absolutely insane? "The nuclear lobby is actively damaging our options to implement technology that works"
When was the last time you heard anybody calling for Australia to introduce specific legislation that prohibits the use of solar power or wind power? Does Barry run national "Choose Solar Free" activism campaigns? Will Brave New Climate employ you to develop and implement strategies that support Australia’s rapid exit from national and global wind and solar fuel chains, as your full-time professional job? As a Climate Change Campaigner at the Australian Conservation Foundation, you'll develop and implement strategies that support Australia’s rapid exit from national and global fossil fuel and uranium fuel chains and move towards a clean energy future. Well, supposedly. And that's your professional career, full time – not a hobby undertaking of public science communication that you do when you go home from your regular work as a university academic or what not. $91,000 isn't too shabby, hey? This really puts the "you're a shill you're a liar you're on the take you're secretly getting paid off stacks of cash from big bad nuclear" nonsense that we deal with every day from conspiracy theorists like Helen Caldicott (and her less well known anonymous counterparts over Web message boards) into context. The ONLY people who ever campaign for any specific technologies to be shunned and banned and eliminated from society, with specific legislation to be put in place at the federal level banning its use, are the anti-nuclearists. Solar and other renewable generation has contexts where it does make sense, for remote, distributed, small-scale off-grid needs, as I touched on above. I've never known any nuclear proponent determined to stop any use of solar where it makes sense to use it. As far as I'm concerned, if any person wants to go and buy PV panels on their roof they are free to do so with their money. But it should not be given subsidies and handouts from the government, or indirectly from other electricity users – "feed-in" prices should reflect the real value of that unreliable, intermittent energy sent to the grid on a very small scale at the time when it is available. This doesn’t mean that grid-scale storage will never be cost-effective. Consider this fact: in the early 2020s first German feed-in tariffs are starting to expire. Those early adopters will have to sell electricity at market prices or consume energy themselves (or some kind of combination). That’s a situation when energy storage will be cost effective, because it is competing against retail rates. This means that there will be multi-GW energy storage market in Germany starting in 2020. Storage is coming in a big way in about 5-10 years. Market research firms also predict huge storage growth. This article goes into details of German power generation during last 10 years or so. The numbers are pretty clear. In 2003-2013 nuclear is down 67 TWh, renewables up 106 TWh, coal and gas down 15 TWh, and exports up 25 TWh. Germany is not an example of rapid emissions reductions (though they did fulfill their Kyoto targets), but it is an example that it’s possible for a big industrialized country to get large amounts of energy from renewable sources. Yes, it would be much better to shut down coal baseload first, and nuclear later. Uranium supply is a serious issue if nuclear is scaled to global levels. Today there are about 400 reactors with about 400GW output. If nuclear wants to supply a meaningful proportion of global energy, let’s say 50%, then it needs to be scaled to at least 8000GW (global energy consumption is about 16-17 TW). That’s a factor of 20. Todays consumption of uranium is about 70000t/year and economical reserves at 2x todays price are about 7000000t. This means about 100 years of supply at todays level of consumption. With 20x more reactors that would last about 5 years. Can’t do it. Even if we go higher than 2x todays prices and discover 10x more reserves, that would still last only 50 years. There’s an uranium crunch waiting out there if you try to scale it globally. Nuclear cannot be scaled globally in the same way it was scaled in some countries in the 70s/80s. Globally you’d need breeder reactors, recycle spent fuel and thorium reactors (and possibly more). That’s nowhere near the timeframe required to substantially cut carbon emissions. Doing this massive experimental nuclear rollout would delay cutting carbon emissions by decades. Anyone following BNC for any length of time knows how to respond to the uranium is running out claim. PPP, read about more efficient nuclear reactors or about uranium from seawater. There’s plenty on generation four reactors on the site. In fact, I think the site’s pro nuclear character dates from thinking that emerged out of the publication of Tom Blees’ book on integral fast reactors. Generation IV reactors are decades away from being commercially built. This implies that if you’re interested in cutting carbon emissions then generation IV is off the table. But maybe I was wrong and this site is not really interested in carbon emissions but only in smashing renewables for no good reason and spreading useless nuclear propaganda. Uranium reserve estimates are like gas reserve estimates … a measure of nothing except exploratory effort. I asked a Santos engineer about our gas reserves some years ago. He said the question was silly … gas is easy to find when you have the incentive to find it (money). He’s been proven right. It’s the same with uranium, and as Luke pointed out, at the right price you can even get it from the ocean. Beloyarsk 3 is a Russian fast reactor that’s been running commercially for 30 years with an average annual electricity output equal to 3.7 Ivanpahs. This is one of the designs the Chinese are looking at … they have 4 planned, but apparently negotiations with the Russians are proving difficult. The Chinese have multiple fast reactor projects. When they decide what to build in bulk, then THAT will be a game changer and happily they are pretty good at rational decision making. I love the meme that “nuclear takes up less land than solar”, which is easily demonstrated as false. There’s over 3GW of solar installed in Australia right now, and almost all of it, >99% is on roof tops taking up exactly no land. Then once we start to build utility scale plants, like the one I am working on the land will still be used for other things. We’re going to graze sheep through ours. This avoids mowing costs and is really good for the sheep. The panels provide shade in summer which stops the grass getting cooked and it actually grows quite well. So? Breeder reactors will be commercialised when it is economic to do so. If that means accelerating their deployment due to uranium supply constraints, then that will happen. As per India. Wouldn’t the builds in Russia, China and India signify that they are commercial? It’s just a matter of having the design approved and licensed then having the relevant consortium build the plant. There is enough CAPEX out there. It is telling, and should give the more introspectively-inclined nuclear opponents pause, that the debate invariably diverts into matters of cost, comparative scalability, anticipated technological breakthroughs etc, when, if nuclear power plants, irradiated fuel rods and radionuclide release were truly as exceptionally dangerous as they blindly believe them to be, that really should be the end of the argument. Here we go again. This time, we are chasing the “it isn’t commercial” meme, which commonly follows (as here) the “there isn’t enough uranium on the planet” meme which follows the “Nuclear is difficult while renewables have solved all their problems” meme. I expect further excursions into “In Australia nuclear power is not legal” and so back around the tedious circle. There is little point in picking apart these arguments again here. They have already been discussed in depth on BNC and elsewhere. Despite my and others’ links to some appropriate articles and discussion threads, the shallow, circular arguments are repeated ad nauseum. I believe that some posts have been written specifically to divert this thread from its purpose, which is to examine the biased and poorly researched content of a national TV program, 4 Corners. Not all contributors have displayed a genuine effort to understand others’ contributions, or to answer the points made. Yet regular contributors have been accused generally of being unfair to more recent arrivals. Que? @actinideage: well spotted. I guess we should be pleased that nobody (yet) has tried to argue safety and we can be even more pleased that nobody has tried to argue DNA safety (which hopefully means that people now understand that a glass of milk or a 30 seconds hard running on a treadmill can cause large numbers of double strand DNA breaks and that sausages really do cause cancer)… So, can we perhaps presume that everybody is at least on the same page here, namely that risks of climate level events (which can displace 10s of millions and kill hundreds of thousands — or more) are much greater than the risks from a technology that has been a massive net saver of lives and reducer of dangerous pollution for the past 40+ years. I’m going to need a reference for the claim “you need at least three days of storage for renewables”. When, in Australia has there ever been zero renewable energy for three whole days? There’s where your thinking is wrong. It’s not “3 days without”. It’s “when does the cumulative deficit of supply below demand exhaust the storage”? If you have 5 days of storage, 10 days of supply of 50% of demand runs it dry. Denmark had been nearly 100% coal powered in the 80s, now it’s less than 50% and it’s continuing to fall. Wind power is clearly reducing coal use. And Denmark has clearly not done in 25 years what France accomplished in 11. Game, set and match to nuclear. @Geoff Thank you for reiterating the primary issue, another thing that quickly becomes lost in the tangled rationalising of goal-post shifting anti-nuclear logic. Since the perceived danger of nuclear energy has taken a back seat to the mundane considerations I described, I demand to know what the relevant sections of the EPBC and ARPANS acts regarding nuclear technology are supposed to be protecting us from? ARPANS Act proceeded the EPBC Act, hence the copy and paste section in the EPBC Act. So in effect the prohibition is to ensure the safety of nuclear and protection from radiation. It shows with the Greens believing (and the Democrats) that as there is a marginal risk it therefore is not ‘safe’ and thus be removed. The Libs and ALP were spineless on the issue. As the detailed blog post on Decarbonise SA showed. If we had the same attitude and logic towards Road Safety laws motor vehicles would be banned outright too. Same deal for the civil aviation laws etc. etc. Regarding utility scale energy storage there is a thread devoted to the topic on BNC Discussion Forums. Seems to me ti be off topic here. Indeed much of the (quite interesting) discussion appears to be off-topic. California, with a population of nearly 40 million, has legislated that a third of its energy should come from renewable sources by 2020. Commissioner Hochschild says it will easily reach that target. DAVID HOCHSCHILD: As a result of that law, we’ve seen a massive increase in investment and innovation in the renewable energy space, and today, California has the largest wind project in the world, the largest geothermal project in the world, the largest solar thermal and solar PV projects in the world, and the largest manufacturing operation in the state of California today is an electric car factory. So we’re seeing enormous momentum as a result of that. STEPHEN LONG: Were you surprised by the pace of the growth of renewable energy? DAVID HOCHSCHILD: You know it’s actually not a surprise because history has shown quite clearly, when you establish a long-term target and provide that certainty for the market, you get investment and you get innovation and it drives down costs. Q1) Is the claim that California will easily reach a target of one-third of its energy from renewable sources by 2020 credible? STEPHEN LONG: As the sun sinks in the sky at Lancaster, California, a baseball game is underway under lights, in a solar-powered stadium. The Lancaster Jet Hawks are leading the California league; their city is leading the way with renewable energy. Heather Swan is an executive with the Lancaster Power Authority, which has overseen a radical shift away from fossil fuels. HEATHER SWAN, LANCASTER POWER AUTHORITY: We’ve kind of gotten started with a grassroots effort that started putting solar on homes and getting the information out to our homeowners and our citizens. Then we took that step a little farther and became the example ourselves and we put solar on our major city facilities. Those city facilities are now powered about 97, 98 per cent by solar. STEPHEN LONG: Lancaster was aiming to be 100 per cent renewable powered by the decade’s end. HEATHER SWAN: Yes, I mean, we were originally given the goal of 2020, but you know I think we can make it happen by 2016. STEPHEN LONG: Just two years away? HEATHER SWAN: When you say it like that, you make it sound so close. But, I know, it’s not far away. STEPHEN LONG: It’s now technically possible to supply all the electricity needs of a city or district without any reliance on fossil fuels. That used to be a pipedream, but new technologies that allow renewable energy to be stored and used day and night are changing the ballgame. Q2) What does this actually mean, the phrase “city facilities’ refers to what exactly? It would seem obvious that it doesn’t refer to all energy needs since the stated Californian goal of 33% through renewables is far less. I looked up wikipedia and found this information about Lancaster not mentioned in the 4 Corners program. 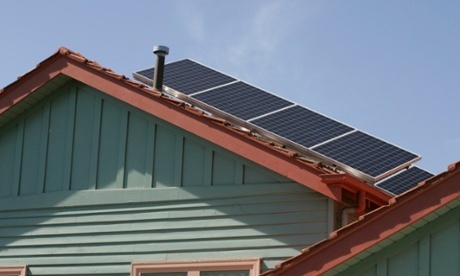 In March 2013, Lancaster became the first city in the US to require solar panels on all new homes in an effort to make the community more carbon neutral. The rule will take effect in January, 2014. STEPHEN LONG: As the lobbying to cut the target finds sympathetic ears in Parliament, in the national capital, there’s a new dawn for renewable energy. If all goes to plan, Canberra will be 90 per cent renewable powered by 2020. SIMON CORBELL, ACT ENERGY MINISTER: That’s the Royalla solar farm. STEPHEN LONG: That is impressive. SIMON CORBELL: it’s 80,000 solar panels – enough power to meet the needs of about 4,500 thousand Canberra homes. STEPHEN LONG: Simon Corbell is the ACT Energy Minister. He’s taken me to a power utility 23 kilometres south of Canberra. It’ll begin operating in a few weeks’ time. SIMON CORBELL: When it does connect, it will be the first large-scale solar power facility connected to the national electricity market. STEPHEN LONG: He’s having a hard time convincing some of his counterparts in the states. SIMON CORBELL: Well the other state governments have vested interests in maintaining the status quo. They collect the royalties from the coal mines; they collect the dividends from the coal-fired generators; they own these assets. And, they are not interested in disrupting that business model, even though that’s locking consumers into higher energy costs over the medium to long term. Q3) Is the claim that Canberra will be 90% renewable powered by 2020 credible? ABC bias. All I can do is note the contrast here between the initial claim about fears that a 20% renewable target might be unreasonably eliminated by the Abbott government contrasted with the claim that California will easily achieve 33% renewables, a city in California (Lancaster) is about to achieve 100% renewables and Canberra will achieve 90% renewables by 2020. On the one hand 20% is worth striving for but might be hard to attain (needs government support / subsidy). On the other hand in California, Lancaster and Canberra much bigger targets are relatively easy to achieve with intelligent policy. It does not compute. The program must be distorting reality but I’m not sure exactly in what way and would appreciate expert comment here. Some 15 years ago I came to a conclusion that the worst possible decision our civilisation can make at this juncture in its history is to try to make dilute energy resources do what dense energy resources (fossil fuels) have done to date. I remain convinced of that but also accept that this is the futile course of action that many are taking. The momentum behind that movement is so strong and optimistic at present that it has to run its course and then discover its futility in hindsight. On the one hand this is very frustrating because in the current climate its impossible to try to step in and try to assert a sane balance. Renewables are on a roll. On the other hand, what is being done with renewables growth is remarkable and if our civilisation is going to come a cropper (i.e. in failing to address the climate emergency) then low density renewable energy is likely to become valued for whatever emerging society comes out of the ruins of modern civilisation. Nuclear advocates can be justified in feeling bitter about this, because many of those have seen nuclear as a way of sustaining our non-sustainable society. Whilst I feel for them, it can also be argued that the climate is just one emergency and even if that emergency had been dealt with by early intervention of nuclear energy, there are many other critical limits that are banging on the door. An obsession with supply-side energy (by both camps) turns a blind eye to our core sustainability problem… asymptotic growth in a finite world. In Canberra the ACT government has guaranteed to builder of royalla solar farm to purchase all Royalla’s generation at a 15% premium above the market cost of purchasing that electricity, for the next 20 years. Please note this is 10% above the Hinkley C strike price for electricity generated a decade from now, which the greens seem to have thought was expensive. confused. How do you account for flows between areas? This is no minor technical detail … for example, Europe has “reduced” her emissions by the simple expediency of “off-shoring” them … (largely by importing goods from China). Actually it’s the nuclear proponents that divert discussion into costs by endlessly questioning integration of renewables. That is not to say that costs don’t matter (on the contrary), but the issue has not been handled in an objective manner. Solar and wind power have shown substantial cost reductions and the same is happening with battery technologies. This goes in favor of integrating ever larger amounts of renewables. This trend is likely to continue and it is very much underappreciated among nuclear proponents. The case for renewables is much stronger than nuclear proponents are willing to admit. And the case for nuclear is much weaker than nuclear proponents are willing to admit. The urgency of carbon emissions reductions is what makes it weak. We can’t wait for decades. Probably even CCS could be done faster than nuclear. I’m not an Australian (I’m from EU, Slovenia) so I can’t really comment about Autralian national TV. But I did want to comment on many weak arguments against renewable energy that are constantly being repeated by nuclear proponents. Repeating weak arguments won’t make them strong and spreading false claims, confusion and disinformation about renewable energy won’t in any way help to reduce emissions. These repeatedly wrong claims and weak arguments have to be addressed. @evcricket: How many sheep will you be grazing per hectare? The methane per sheep will offset some of the emissions saving from the panels. It won’t be a big fraction with a utility scale solar farm, but consider the bigger picture … do the math over Australia … at a GWP over 20 years of 105 (http://www.sciencemag.org/content/326/5953/716 ) Australia’s current 3GW of panels don’t even come close to saving an amount of CO2 which would compensate for the warming produced by the methane from our 70 million sheep. And our cattle emit as much methane again as another 360 million sheep! And then there’s the deforestation..
Geoff you seem to be suggesting that building a solar farm leads to more sheep? Perhaps in your case it does, but no, I’m merely pointing out that 3GW of solar panels (or anything else) doesn’t even begin to tackle the size of problem we have and that the problem isn’t just about energy. Australians would still be way above a sustainable long term level of emissions (about 1 tonne CO2eq/person/yr) even with 100% clean electricity and transport. Actually, that paragraph made a specific point which is entirely missed when only partially quoted as in your comment. This makes for effective polemic but particularly poor discussion. Whether you missed the point or just wanted to avoid it… well, future comment thread readers are free to judge. I am employed in manufacturing. A day’s power outage will cost us at least a week’s hard work in terms of input costs, product quality, wasted human resources and customer satisfaction. If my industry had only intermittent electricity supply plus a nebulous amount of unproven, grid-scale electrical backup (which in any scenario would require a prohibititively large overbuild to provide the necessary confidence in reliability – how much would THAT cost? and would it still be enough?) to rely on, it would decommission every facility we have and reopen in another country where reliable power could be guaranteed. It would wear the cost of shipping the Australian produced primary inputs to the new country, and Australia would unnecessarily lose yet another value-adding industry. I know what I’m talking about here. On that point, Geoff, you are absolutely correct. Those who dwell on supply side energy solutions are mostly very admirable folk but totally naive about the scale of the sustainability predicament that we all face. Whether we focus on nukes or renewables, there needs to be an understanding that we are focussing on perhaps 10 percent of the sustainability problem…. and the easy part. All strength to those who are pursuing these endeavours, but please just don’t let’s kid ourselves that by switching energy horses the world will become miraculously sustainable. The main reason society loves renewable energy it provides a safe delusion to the average person that they can continue to maintain their profligate lifestyle and wasteful economy with little pain. The average Australian is happy to fork out for a few solar panels on their roof as a small price to pay for thinking of themselves as living sustainably. @actinideage: Germany is fifth largest economy in the world and it’s doing very well even with large amounts of renewables on their grid. Germany is fifth largest economy in the world and it’s doing very well even with large amounts of brown coal derived electrical power on their grid. See how meaningless such comments are? Beside which, what is Germany doing about the other 75% of their national energy and CO2-e budget, the stuff of heating, land transport, manufacturing, air and sea and imported embodied energy? If the only target that Germany hits by 2050 is 50% of 25%, then their CO2-e emissions as a nation will remain at 87.5% of their emissions at the start of the century. I am convinced that this is far short of what Europe’s largest economy and the world’s 5th largest will need to achieve in order to stabilise our climate. I understand and accept your faith in renewables to make a difference, but if at the same time zero carbon options are being ignored and the overall target remains woefully short, is it not all for nothing? My analogy is a sinking ship with three bilge pumps. One is labelled “Nuclear” and is turned off. Another is “Green” and remains in service. Unfortunately, the inrush of water is greater than the remaining pump, so the ship sinks. The German CO2-e ship is still sinking, and so is the world’s, but the numbers look nice to the Greens, because they have reached 50% of a failed outcome. Renewables Vs Nuclear is fighting the wrong war. The war is CO2-e Vs Climate stability. This is also where 4Corners failed. Germany imports about two thirds of its energy, mostly in the form of petroleum products and heating gas but also electricity. Its plan to progressively phase out its nuclear plants rests mostly on 26 new approvals to build brown coal stations. The green dream is that these approvals are a stepping stone as renewables are built up, but the very happy German coal industry isn’t thinking along those lines at all. Germany’s renewables adventure is truly remarkable, all the same, and should be applauded but I wouldn’t use Germany as a role model for sustainable futures. Denmark may be a slightly better example, though it has the advantage of having an economy not based on heavy energy-consuming industry. I should have added that not all of those who install solar are ignorant of the bigger picture. The renewables movement is actually driven by a genuine desire to transition society away from its current path. For the most part, though, society really likes the thought that there is an easy way out and our Western upbringing informs us that the way to do that is to just buy something. The ‘solution’ that we buy is like an icon. I think many in the renewables movement know full well that this action alone is really superficial, but they also want to give out Hope. There is a sort of unstated belief that once members of the public are brought on board via these rather symbolic / iconic actions then they will be drawn into the bigger picture and be prepared for a much more radical transformation of their lives. Maybe that’s true, but we will only test that theory once. Then again, such is the buoyant confidence in the renewables push at present that many within the movement have naively concluded that renewable energy can seamlessly take over from coal and oil and the whole machinery of industrial civilisation can be kept going more or less unimpeded. That’s where I jump off the train. Bad example – thousands of Germany’s industries are exempt from covering the extra costs of RE expansion. @lukeweston, I think the “all options” was probably from an earlier comment I made. I realise now it lacked some critical context as to my position on that phrase. By “all options” I mean all options on the table or realistically in the pre-feasibility study/scoping study. Options can be excluded only after a proper study has determined the unsuitability for the specifics of the project. It’s not the case of “We have a wind turbine, a solar plant, a nuclear plant so now we need a hydro facility”, quite the contrary. Hopefully this clarifies the terminology I used. The issue I see is that Nuclear is great for the bulk of the load cycle, day-to-day, however the peaks require some faster ramping and clever grid management solutions if Gas is eventually needed to go. I acknowledge that theoretically Nuclear can be ramped quickly. The discussions I’ve been in with some nuclear engineers working in US plants tell me that it can hurt the physics of the core and it’s ability to provide effective fissioning, and therefore is usually avoided. It can be done, but only in cases where it is for emergencies not day-to-day management. There needs to be clean energy technologies that can be able to react to the demand as quickly as gas turbines can now. One of the reasons why SA has been so successful with wind is we had an existing gas turbine fleet that can adjust to demand. So, hence, why feasibility studies need to have an all options approach and sort the wheat from the chaff. So what do the nuclear campaigners actually want? To be considered part of the mix? To be acknowledged as an option in parliament? What would be a positive next step for you? Whether or not I support nuclear is neither her nor there; I am certain one will never get built in Australia. They’re 15 years away from generating and the price of solar and storage will kill it. No one would build one in that economic environment and it explains why no proposals have been put forward. If anyone actually wanted to build a nuke in Australia they would be campaigning for it, but there it not the demand, nor certainty of demand to bother building one. The ACT’s 20MW PV installation will put out 37,000MWh annually, or average 4.30MW. That is truly small beer in relation to the NEM’s statistics. It states that the objective is to make Canberra carbon neutral by 2060, but makes no mention of other than electrical energy. The new plant might take care of the first 1/3 or 1/4 of the ACT’s CO2-e emissions, but what about the rest? Further, given that the commercial life of this type of plant is no longer than 20 years, it is a bit rich to make claims 45 years out, by which time they will have thrown away the first two sets of collectors and much of the ancillary plant. Geoff Russell referred to a “sustainable long term level of emissions” of about 1 tonne CO2eq/person/yr. Seven gigatons per annum!? No, I do not believe that you obtained this figure from any scientifically respectable source. C’mon Geoff, show us! While the level of greenhouse gases continue to accelerate upwards, we should not be contemplating any idea of a sustainable emission rate. The only process faintly resembling a long-term restoring force is the weathering of rock — at a rate that will remain overwhelmed by the current excess level of GHGs for thousands of years. On the ACT government website. Obviously, I haven’t read it all yet, but it appears to be aiming high. Certainly, its scope is wider than I had anticipated. I noticed a bit of bad press about the effect of the solar panels on local houses, apart from which I have heard little till this comments string. Yeah the main opposition is from the village of Uriarra. They’re building I think the 20MW farm there and the locals think it’s too close to the ‘town’ and ruins the rural setting. There is no sustainable level of fossil carbon emissions. Enthusiasts for so-called “low carbon” power sources that rely upon gas as a backup repeatedly misquote this advice (most notably from James Hansen) by referring to a 2050 low-carbon level as a target instead of a milestone on the way to zero emissions. @evcricket. Just because something isn’t loud and public doesn’t mean it’s not being advocated. Nuclear is a contentious issue going public at the wrong time with little coordination causes a 2007 style implosion. First step has always been to overturn the prohibition. After that it is securing the international partnerships and interest. UAE started their journey in 2008/09 and now they have the first RPV of four being installed as we speak. First electricity by 2017, and using Korean Nuclear assistance. Korea historically has consistent 60 month build rates. removal of the legislative impediment to nuclear in this country. That’s pretty much it. Provided nuclear can compete on its merits within a framework that provides enough selection pressure for low carbon energy to displace fossils, I’d be happy. If it turns out that the deepest, fastest and cheapest emissions cuts come from renewables, I’d be generally happy with that. I say generally happy, because I don’t believe it would be optimal, and I think nuclear has a smaller environmental impact than renewables. But CO2 reduction is this generation’s priority, so, whatever works. Now, under such conditions, provided the driving framework is honest and complete about full life cycle emissions and embodied and offshored emissions etc. and isn’t subject to the usual gaming, I think nuclear will outcompete renewables and renewables will become unattractive after relatively modest penetration in the grid. Under the above conditions, if I’m wrong, we still get big emissions reductions. And I’m fine with that. But if I’m right, and the above conditions are not met, then we’re in serious trouble. And I think I’m right. Roger. Agreed. The gradual atmospheric reduction in CO2 that emerges in models assumes that fossil fuels are totally phased out. But the reduction in atmospheric levels presumes that atmospheric CO2 is taken up by the biosphere so presumably there’s a point where emissions match absorption so there could be a non-zero long term emission allowance. I’ll admit to being sloppy … but the issue of long term sustainable CO2eq is slightly different. Does anybody know an answer? The airborne fraction of fossil CO2 emissions has been steady at 50-60% for a number of decades, so a straight reading of this suggests if we cut our emissions by half, then we’d stop a further rise in CO2 concentration. But this is dependent on the oceans and vegetation being able to maintain their elevated’sink’ capacity (vs pre-industrial) for many decades, which is rather uncertain! are more credible than the Canberra claims. “We want to be the first city that produces more electricity from solar energy than we consume on a daily basis,” he said. This means Lancaster’s rooftops, alfalfa fields and parking lots must be covered with solar panels to generate a total of 126 megawatts of solar power above the 39 megawatts already being generated and the 50 megawatts under construction…. The lifetime costs of a large solar facility are expected to be about 15 percent more than electricity bought from the state’s grid. Those projected costs are now roughly half of what they were five years ago, state figures show. Around the country, photovoltaic energy is increasingly being embraced as panel prices fall. Nationally, photovoltaic generating capacity rose 76 percent in 2012, according to the Solar Energy Industries Association; more than 40 percent of the country’s solar capacity of 7,700 megawatts came on line last year. @barry: Yes, I gather that the “air born fraction” is one of those numbers which climate scientists watch as carefully as economists watch the “current account deficit” but I certainly don’t understand how it relates to the claims that cumulative emissions is the be-all and end-all of our impact on forcing. @actinideage: some consistency would be helpful. First you talk about grid stability, but then, when faced with a fact that Germany has no problems with that, you change your mind and start talking about industry exemptions. I take that you now understand that renewables are not a threat to grid stability. @singletonengineer: I was talking about grid stability and Germany clearly shows that it’s not a problem for 20-30% renewables penetration. And this of course is not an upper limit, but a lower limit. Since you ask ‘what is Germany doing in other sectors?’, they have comprehensive programs for biofuels, geothermal heat, solar hot water, heat pumps, insulation, seasonal heat storage, and so forth. It’s called an energy transition for a reason (not just electricity transition). But people from outside of Germany don’t really know it and they just assume whatever fits their imagination. Of course, much of the balance of this is finding its way into the oceans where it is wreaking its own merry havoc. The line between discourse and insult has been crossed. PPP’s responses to rational and patient criticism, as per the last sentence of the contribution 40 minutes ago indicate finally and for certain that I have been wasting my time and his. Sorry, folks. I’ll see you on a future thread. I did not mention grid stability in the context of renewable energy, as I expect our future readers will notice even if you didn’t. I clearly referred to a hypothetical case of renewable energy relying on storage technology, its inherent unreliability and implied stratospheric costs, and how it would end industry in Australia. Germany now has massive investment in renewables but any similarity to my scenario ends there as we all know their primary capacity is coal, hydro and, still, nuclear energy. Again, I expect future readers will understand that, as such, it looked like another change of topic on your part, and I was happy to point out the paradoxical need to shield German industry from the cost borne by the rest of the country. But I’m about as happy as singletonengineer now, I completely agree with him, and I’ve better things to do than have my reasoning consistently ignored. @actinideage: clearly you do not know the numbers. More than half of renewable generation in Germany comes from wind+solar (the rest is mostly biomass, hydro being the smallest). Renewables have gotten much bigger than nuclear (even wind+solar on their own generate the same as nuclear) and you should take into consideration these real world facts. Check for details and see for yourself. Where did you get that 100% renewable grid would be unreliable is beyond me. You’ve just made that up. Multiple studies have shown that 100% renewable grids are possible with the same reliability as todays. This is a simulation for Germany for 100% renewable grid. Just click for simulation and see how it plays out with real world data. It combines renewables (mostly solar and wind) with power-to-gas. Do the transmission lines which will be needed to connect the wind, ST and PV to the loads exist? If not, what is the budget for their construction? More detail regarding the power-to-gas, please. How much exists at present? Commercial viability? Preferably in English, but I do understand that Germans do inevitably converse in the language of their birth. @singletonengineer: Germany is building several transmission lines (including HVDC from north to south), but I don’t know about the costs. Power-to-gas is about using electricity to make methane (and store it in the gas grid). Then use gas turbine when needed. Round trip efficiency is about 30-38%. Germany has several pilot projects up and running, but nothing commercial (because natural gas is cheaper). @ ppp251 — storing electricity by conversion of CO2 to CH4 and the later burning of the CH4 in a single-stage turbine back to electricity again, could not possibly be done for 33% round-trip efficiency. But then, you didn’t exactly say “CO2”. Perhaps you started with another, more energetic hydrocarbon instead? That would invalidate any claim to be a zero emission process. Roger do some research rather than relying on your gut next time eh? In a competition between wikipedia and someone’s feelings I’m taking Wikipedia every time. @EvCricket. Although bystanders might be surprised, I actually agree with you: commenters ought to check their gut feelings against facts before reacting in print. In this case however, the efficiency of single stage gas turbines has been well studied on this website (search for “peaker”). Similarly the Gautier reactions for converting CO2 to CH4 had been studied here too. Neither of them is 50% efficient so their product is much less than 33%. For that matter, did you check the link that you claimed would back up your assertion of 33% efficiency? In fact it does nothing of the sort: the starting point for the process that arrives at methane does not start with CO2 at all, but with something called “biogas”. Since biogas certainly includes an unstated proportion of methane, you cannot claim that your process is an efficient storage of electricity. Biogas is used in the second stage as a CO2 source (it is also possible to take CO2 from air, but it reduces efficiency for a percentage point or two). Electrolysis is about 70% efficient, methanation about 80%. That gives you about 56% (electricity -> methane). Modern combined cycle gas turbines are up to 60% efficient. So in the end you get about 33% round trip efficiency (electricity -> methane -> electricity). Wikipedia states anywhere between 30-38%. biogas is a catchall term encompassing some really good technologies (e.g.., dealing with genuine waste) through to things where the emission’s associated with producing the feedstock is far larger than any energy produced (e.g., biogas from cattle manure). … and then there’s corn … I’d prefer land is used for food or wildlife, using it for producing energy crops indicates a belief that even trivial amounts of energy for human use is worth killing and displacing vast amounts of wildlife habitat. 1. Since the biogas will be substantially used for rapid response generation, it is probable that a large fraction of it will not be used in CCGT’s as your efficiency calculation suggests, but in existing (ie not always top-of-the-range) open cycle GT’s, with efficiencies in the mid-30 percent range. 2. The energy cost in compressing the gas into the existing distribution mains, which you have previously stated is part of the concept, is missing from your estimate. 3. You have not stated what pressure the storage of hydrogen will be at: My experience using electrolytic generation of H2 is of storage well above 10 atmospheres. This imposes a substantial energy cost. Locally, transport of H2 by road is also at these high pressures. Twenty to twenty-five percent overall system efficiency seems to be much closer to the mark, unless you have evidence of German commitment to low pressure storage of both hydrogen and methane and outlawing of use of gas in OCGT’s. Besides which, if economics mean anything at all, then H2 from suppliers who generate it by steam reformation of natural gas under pressure will out-compete electrolytic hydrogen, as hinted at by Roger Clifton above and has been the case for many years for hydrogen used in generator cooling systems in NSW, Australia. This is despite their having access to very cheap electricity and existing H2 generating plant and thus no capital cost). That something is possible is no indicator that it is practical, otherwise we would obtain almost all of our metals from sea water and outlaw mining globally. This still leave unanswered Geoff Russell’s point about the unsustainable nature of most biosolids sources. Everything I have written in this post is old news. It has been debated, with citations, elsewhere on BNC in many threads and Tcase articles. Does anybody recall how this current discussion relates to the 4Corners program? 100% renewables could be just a hype but the wind and solar, backed by storage, could have a niche of usefulness. For static installations and homes, Nickel-Iron battery could be a useful storage system. As for electric vehicles, new batteries are being developed and some might work out. Solar panel roof may add useful energy back up to an electric vehicle but you have to have charging too. @singletonengineer: Energy cost of compression is small. Compressing methane to 80 bar takes about 1-2% of energy that is stored. You have all the numbers on Wikipedia article that I linked. Economics is of course important and cheap natural gas is the reason that there are no commercial applications. But natural gas will not always be cheap and if wind and solar push prices of electricity towards zero (or negative) often enough this will start to make economic sense. Your logic is absolutely rock solid. OK, I eat meat and heaps of it, but each year or so, when I kill a steer, I wonder whether it will be the last. I also, as you will realise from above, drive a large vehicle which is a bit of a hangover from my working past. It worries me a little that my diet might have to change. It also worries me that other, more significant, lifestyle choices will soon reach into my frontal lobes and drive change. My son is setting an example. He does not own a car. He moved house so that he can commute via light rail. His family uses a rented Go-Get car when they need one, which is about once per month. They don’t have air conditioning in their home. He and his family walk and cycle and are an example to us all. But they never talk about their low carbon lifestyle. They have never argued with me about my one airconditioned room or my large home and vehicles. Maybe this whole discussion will change shape once his peers are at the helm. My generation simply don’t care enough to get off their collective rear ends. Our kids aren’t arguing about change: they just do it. There’s hope yet, provided that they analyse their options thoroughly. 4C’s, in this context, is an example of a program that probably passes my son and his peers by. BTW: PPP’s last comment indicates that he also believes in a rosy future. In his case, it is one where the price of NG is so high that it will not be economic to use it as a feedstock for production of H2. This is a forlorn hope. There is far more natural gas underground than can ethically be used. That line of thought will fry us all. @singletonengineer: you neglected the fact that solar and wind push prices to zero (or below). This goes in favor of power to gas, because it can use these low prices to produce hydrogen/methane. Today hydrogen is also used for fertilizer production. We need to stop getting it from natural gas anyway. And if we get hydrogen from other sources (biomass or electrolysis), then we can use it to create methane for storage. Solving fertilizer issue means solving energy storage issue. No, I did not forget that solar and wind push prices to below zero. Solar and wind plus backup have higher cost profiles than coal, nuclear and CCGT, no matter which study you look at. Thus, industries built around solar plus wind will always have long run costs higher than the other two, unless and until something distorts the market, such as a tax on CO2-e emissions or a subsidy for the politically preferred energy source, or one energy source is banned for political reasons, as is nuclear power in Australia and, effectively, Japan. What you said amounts to a belief that solar and wind will be advantaged at some future date by legislative intervention. Even if and when this happens, the production cost and the sale price of solar and wind power will be significantly above zero and significantly above the prices that we currently pay. If you do not agree that this is so, it is up to you to find a reference for your “prices below zero” claim – and for much longer time periods than a market glitch of an hour or two in the middle of high summer. It needs to be true at least 20 percent of the year – say, 1700 hours at least, to come close to providing the opportunity to generate H2 at zero energy cost. Even then, your maths will fail, because your H2 plant will need to be 5 times as large as one which operates continuously, with 5 times the capital costs and an increase in operating costs. I don’t believe that you are so silly as to believe what you wrote, so I must assume that you lifted it, uncritically, from a list of talking points which was prepared by one-eyed advocates of solar + wind. As I have stated before, there are threads on this site and elsewhere which analyse in detail the costs and energy cycle efficiencies of various energy storage technologies, including gas. The numbers have been done, but nowhere have I seen anybody so crazy brave as to state that solar and wind power are guaranteed to result in below zero industrial electricity prices for continuous production processes. That is truly a first. @singletonengineer: the point was that electrolysers can avoid higher prices and use lower prices which improves their economics. It is entirely conceivable that some day they will be competitive. They will have to be in order to solve fertilizer issue. I suggest that you re-read your last two posts and my response. You have made an incorrect claim. Well, long run negative costs for solar and wind are not possible. You are dead wrong and are now trying to avoid correcting your error. At no time in the future will this magical negative cost be correct. As for your last sentence, the mention of fertiliser is simply and only yet another attempt by you to deflect the discussion even further away from the 4Corners. Every time you reach a dead end, and that is every single path you have followed, you have switched direction. Mostly, these switches have been unsupported by references or logic – as for the negative cost furphy. Do you have anything cogent to say about the 4Corners program, or do you not? Did you bother to watch it? ppp51 displays all the signs of the “true believer”. He is heavily invested in his position and so cannot stand cognitive dissonance; any time facts and logic challenge the dogma he is forced to exercise “crimestop” and change the subject. Such dogma is a self-inflicted brain injury. @singletonengineer: noone knows exactly how economics will play out. It’s not just capacity factor that matters. There are gas peakers that have less than 10% capacity factor and we still use them. We use cars and we use them less than 10% of the time (even in commercial sector usage is well below 50%). Obviously there’s more to it than just capacity factor. Capital costs are not the only costs for electrolysis. Costs of input electricity are greater than capital costs (and therefore more important). This means that being able to avoid high electricity prices and use low ones is a significant advantage. In addition to that, electrolysers can ramp output up and down and can earn additional income by providing grid stability services. Therefore suggesting that reducing capital costs by boosting high capacity factor is the only thing that matters is a narrow minded nuclear apologetics. Any rational thinking person can see right through it. Furthermore, phasing out natural gas is necessary and this implies that other sources of hydrogen are needed. If we do find them, then they can also be used for energy storage. This is not avoidance of any kind, this is merely a statement of fact. Rational argument never did make much of an impression on religious fanatics. The 4 corners episode promoting intermittent power sources could be used to turn a negative into a positive. If permission to use the programme contents could be negotiated, it could easily be revamped into a critique of intermittents by inserting some short sharp and factual commentary after each rose coloured assertion made in the programme: commentary that could can be backed up with data, but not so full of statistics that an audience would fall asleep after 5 minutes. The commentator(s) would use a neutral but assertive approach, non apologetic, and include any images that help to make the point and make it memorable. The programme in fact offers a perfect vehicle for a rebuttal of the sort of nonsense that is currently being put about by the advocates of intermittent power. If there is anyone out there who knows how to get a project like this started? I sometimes wonder if the word renewable, with all its touchy feely connotations, were replaced with the word intermittent, a lot of people would quickly focus on the limitations of a technology that is currently being promoted, with apparent increasing success, as the answer to global warming. Robert Hinds, you’re quite right, that is the sort of critical analysis we needed Stephen Long of the ABC to have done, but didn’t. The questionability of using the word “renewable” was actually fed to him (and us) by that author chappie, chanting off the semi-religious belief that fossil fuels are being rapidly depleted. It should have been followed by the commentator’s question: “when we going to run out of coal?” Regardless of what the author replied, any geologist could be heard to reply to the same question with “almost never”, or words to that effect. He could then have pushed the question, so what is the urgency? Certainly the introduction should have sketched the essentials of AGW, and quoted the IPCC on the necessity of reducing emissions (to zero!). That would have allowed the proponents of solar energy to give their sales pitch for their wares. And perhaps even a climatologist, grinding his teeth and repeating their message. I sympathised with the CSIRO (who do world-class research by accepting money from big industries to make flattering comments on some difficult or impossible scheme). The commentator could easily have asked the author of the statement “50% prosumers by the year 2050”, the question obvious to us, “why only 50%?”. Then when the author explained that the grid would become unstable above 50% unreliables, the story would become more exciting. However instead of an exciting story, we were given a sales pitch for a fashionable industry. How disappointing. The word “renewable” should not be replaced with the word “intermittent” but with the word “unreliable”, which is closest to the truth. The sooner the fad/fashion that is renewables is seen for what it is, the sooner true discussion can start. Here in Tasmania our hydro-electric system is almost 100 percent reliable. There are pluses and minuses with every energy source. Describing renewables as being inherently ‘unreliable’ is about as disingenuous as describing nuclear energy as inherently ‘dangerous’. But I understand your frustration ad why you would like to turn the tables. People are obviously talking here about ‘technosolar’ and its capacity to scale up, as was the 4Corners programme. Not hydro. To imply otherwise is disingenuous. Good job guys you insulted your opponents until you won the argument. Well done. Now opposition to nuclear power in the community has vanished and it is being rolled out across the country. Careful of projection there, evcricket. Here in Tasmania our hydro-electric system is almost 100 percent reliable. Because it draws from a stockpile of energy, Chris. Should you drain your reservoirs your reliability will abruptly vanish. That is the difference between a stockpile and a flow. Flows are not reliable. Yep, I’m the first to agree that every power source has its downsides. An impending El Nino is not good for Tasmania’s energy security. But I wouldn’t argue against hydro power per se on those grounds. It also does have immense biodiversity impacts and, in any case, most places don’t have any scope for hydro development. I also agree that many objections to nuclear energy, especially safety ones, are totally illogical when one considers the other technologies that we are totally happy with, like our cars. I fully understand the frustration within the nuclear energy lobby, but it’s not helpful to work from a resentful mind-set. The suggestion that this conversation has included an argument against hydro is not correct. It is a straw man. Whatever you said after that claim is thus irrelevant. There is an honest and continuing effort by several contributors here to actually understand what other contributors are saying and to take care not to misrepresent what they say. This extends to recognition of the value of contributions and to explain where on BNC other information and analysis has been posted over the past several years. Nobody has “argue[d] against hydro power per se on those grounds” (el nino and energy security). Why do you pretend that this is so? Repeating, I do empathise with many nuclear advocates because I know some personally and these folk are genuinely committed to climate change action and despair that the nuclear solution that they see as being the only viable ‘dense energy’ alternative has been swept under the carpet by the wave of enthusiasm for renewables. Graham Palmer’s book is closer to my position on the more technical matters and this has been covered in a later post on BNC. It can be rather difficult in environmental circles to raise the issue of nuclear technology developments because for many in those circles the shutters come down. I must say on the other hand (and others have commented on this as well) is that the intolerance of some overly earnest folk who agitate for nuclear tends to push potential people away from their cause. Every lobbying movement has some of those. Practically all the possible arguments for and against wind and solar have been given above. I can only give summaries by my own perception. The biggest country in Europe is going off nuclear. The biggest countries in the world are going for nuclear and closed fuel cycle in a big way. Renewable s are a successful means in isolated areas. Base load power plus distribution is balanced against distributed generation plus storage. That gives a niche to renewable s. Maybe even some back up share. Spent nuclear fuel has to be recycled. Russia and Asians are going that way. It minimizes the storage requirement. Russians have just started their next fast reactor. Indians are close to it. Chinese have experimental fast reactors and are planning for fast power reactors. Crossing over from BNC to Renew Economy and then back again… who does the non technical person (i.e. those in media) believe? Chris, REneweconomy is clearly a site which is built on two buzz phrases: Smart energy and renewable energy, both of which are used as articles of faith and are meaningless in this context. That is why BNC usually avoids discussion of sites such as this and, in particular, to sites which are run by folk who have a financial stake in the technologies which they are advocating. Real journalists have no difficulty discriminating between commercial spin, quasi-religious preaching to the converted and demonstrable facts. Without wanting to overstate the obvious, Giles left Climate Spectator to found ReNewEconomy, which is a for-profit site that earns revenue selling mostly to the solar and related industries – refer those ads on the right. ReNew has developed a brand around building a narrative of new technology, energy revolutions, and disruptive solar technologies. It no doubt understands its demographic, and I think Giles and other contributors believe in what they do. More clicks equals more revenue – as to the value of content, make up your own mind. An anti-nuclear piece (lead author Mycle Schneider) is a free kick for a site indirectly earning revenue when solar panels are sold – there aren’t too many retail consumers in the market for a SMR just yet …. Making a profit doesn’t mean the arguments are wrong. Many environmentalists believe renewables are the answer and they engage in commecial activity to speed things up. Many climate scientists are engaged in communicating climate issue and they get paid for it. Does that make them biased? Not automatically. Some people are honest about their beliefs. PPP251, are you suggesting that commercial bias is irrelevant? Are you suggesting that I advocate that there must be full disclosure of all advocating that there should be no disclosure of personal involvement? Of course that is not so, provided that there is disclosure of personal involvement in the industry. What is yours? I am happy to argue that those who join the debate first disclose their affiliations. I have none. Do you? I’m not involved in renewable business. But I don’t dismiss everyone who is, because not everyone’s motivation is money. ppp251, I certainly wouldn’t dismiss the value of ReNew simply because of commercial bias – it still has newsworthy content and I don’t doubt the sincerity of its contributors. Frankly, I don’t visit the site much but my observation is that the site does what every other media outlet does – it creates a pitch that engages its target demographic so that visitors will return frequently and click through. An example is Giles’ pitch for “the death spiral” and the “death of coal” due to solar. He gets multiple stories, different angles, commentary – which translates into lots of unique visits. On the other hand, reminding visitors of the longevity of coal is not going to attract many clicks nor attract solar industry revenue…..
Another example – doing an interesting article on the remarkable longevity and resilience of the lead-acid battery. Modern construction can be traced to 1881, and the battery continues to be the battery-of-choice for off-grid solar. But this will be one article for one day. But construct a narrative of disruptive change, emerging batteries and novel storage technology – and this will ensure open-ended articles, narratives, and commentary into the future – work it out yourself. @ppp251 compares the sales spin on a website with the publications of climate scientists. There is a world of difference between making money out of a community’s ignorance and being paid a miserly salary to tell them the facts.